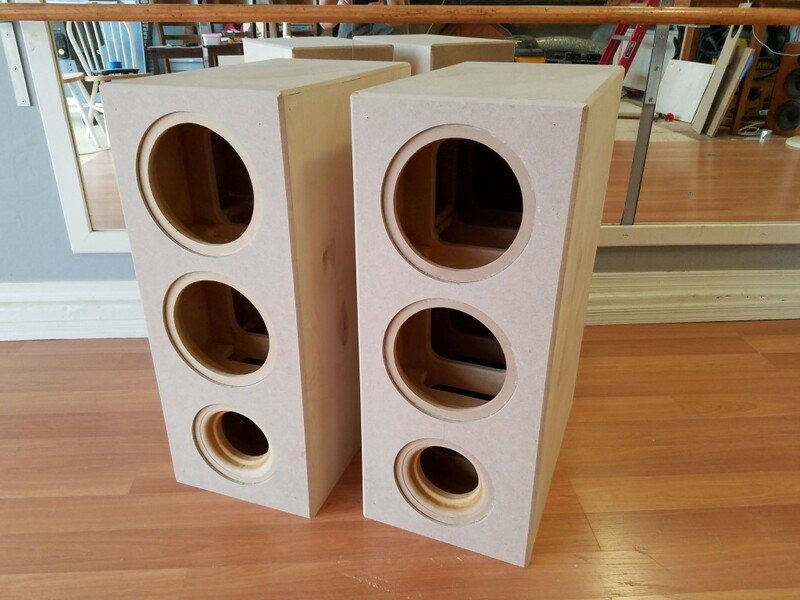 ← The DM-4 Active Reference Series Speaker Project Has Begun! 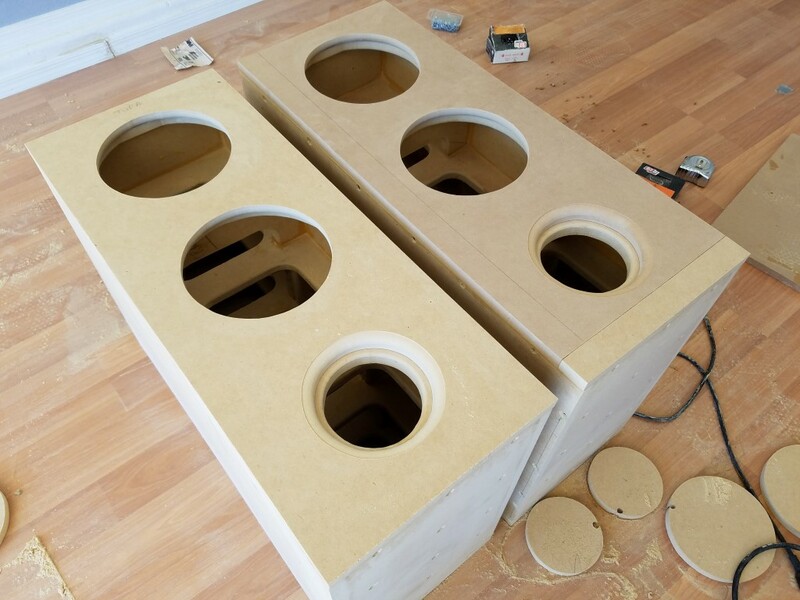 So it’s been a couple of weeks since my last post and I’ve made significant progress on the ‘ole speaker project. 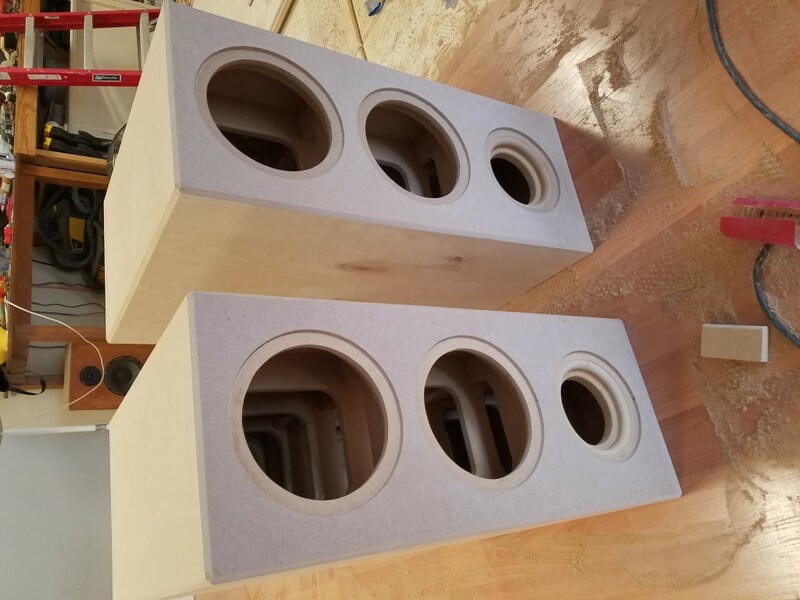 I figured it was time to do a quick write-up and post some more pictures. 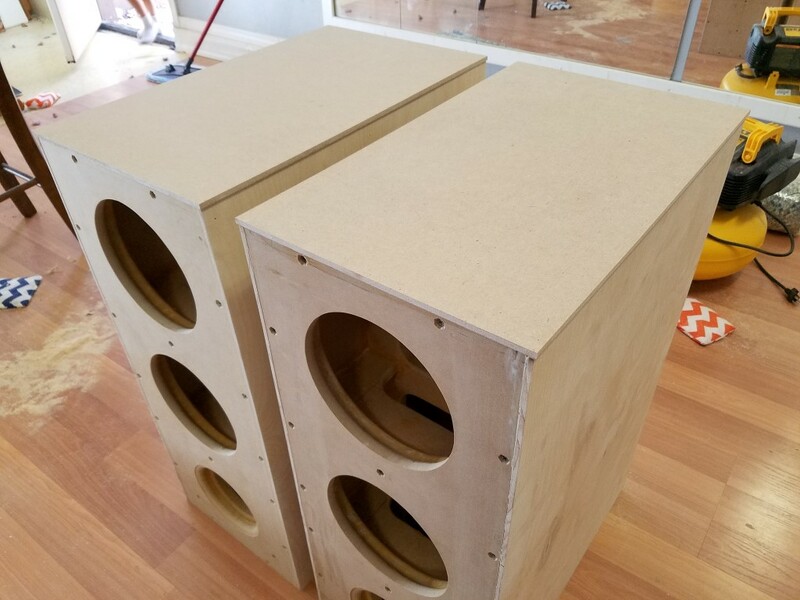 Last I left off I had completed 5 of six sides and left all of the internal bracing exposed. 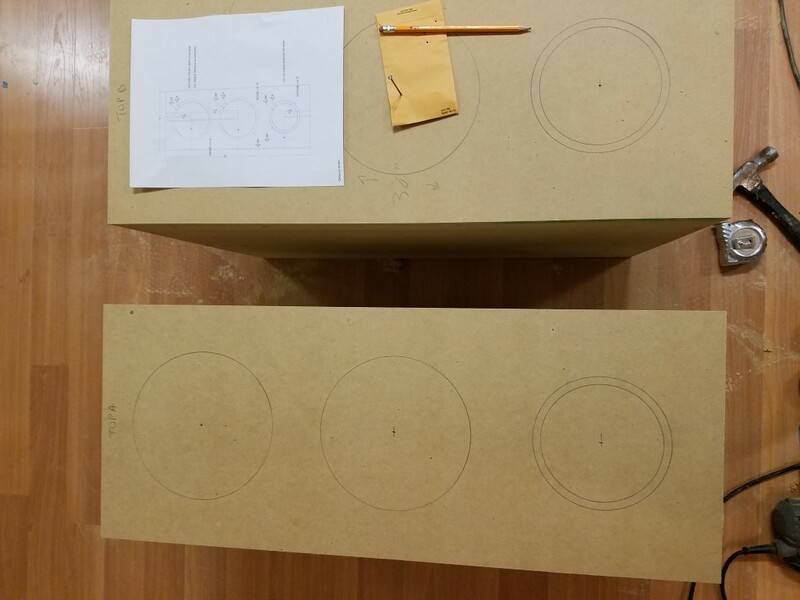 The plan for damping is still in work as well as figuring out some means of measuring the enclosures in stages with progressive amounts of damping with different materials in different quantities until I achieve what I would call “reasonable expectations” with regard to resonances. 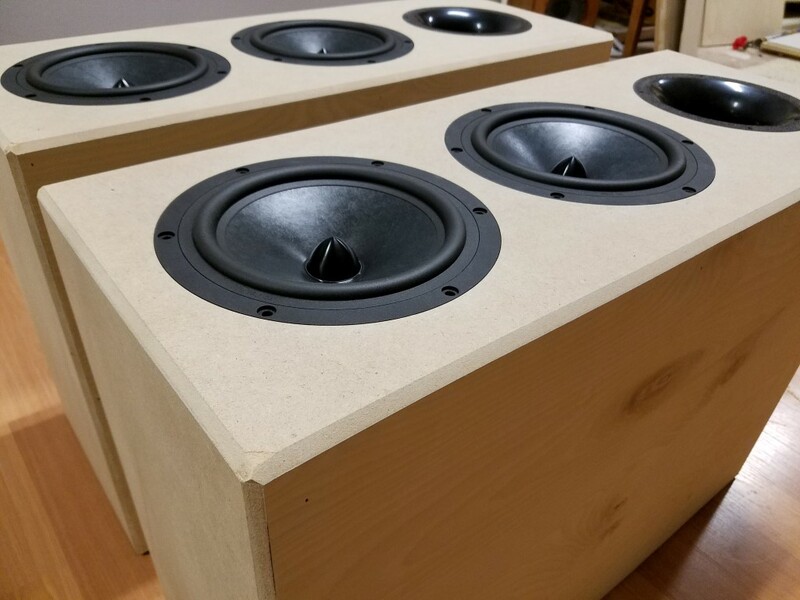 Or in other words, I want to get the structural and acoustic damping “just right” and only my ears and some measurement equipment is going to be able help me get there. 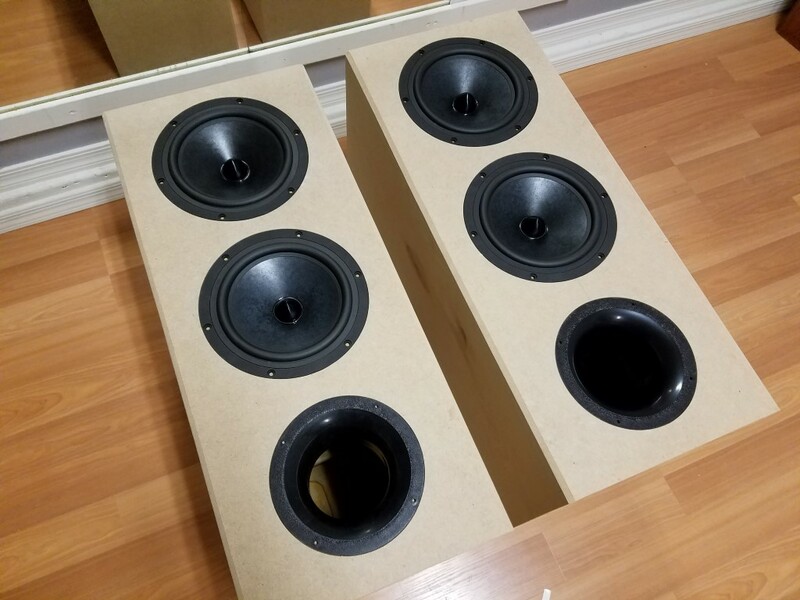 Which means the speaker enclosures needed to be done so I can get to point of dropping in the speakers and taking some measurements. 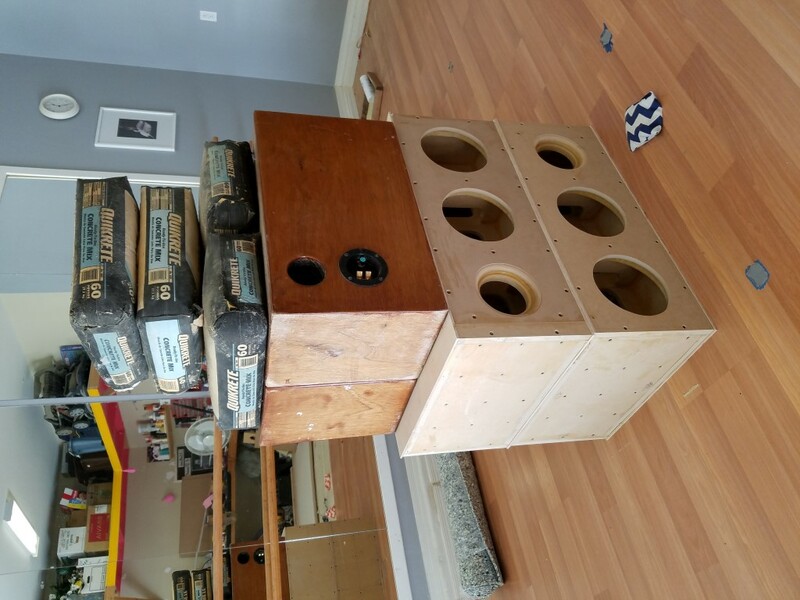 Besides, I still haven’t come up with the perfect combination of glue/foam/carpet pad/cotton/egg crate/wool/polyfil to dampen these puppies just right. 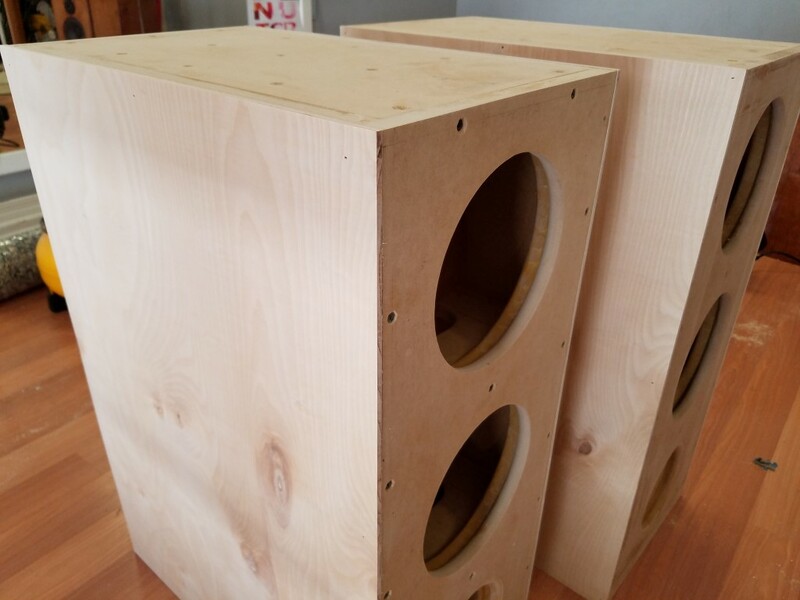 So I left off with the second back panel, main front panel and one side incomplete. 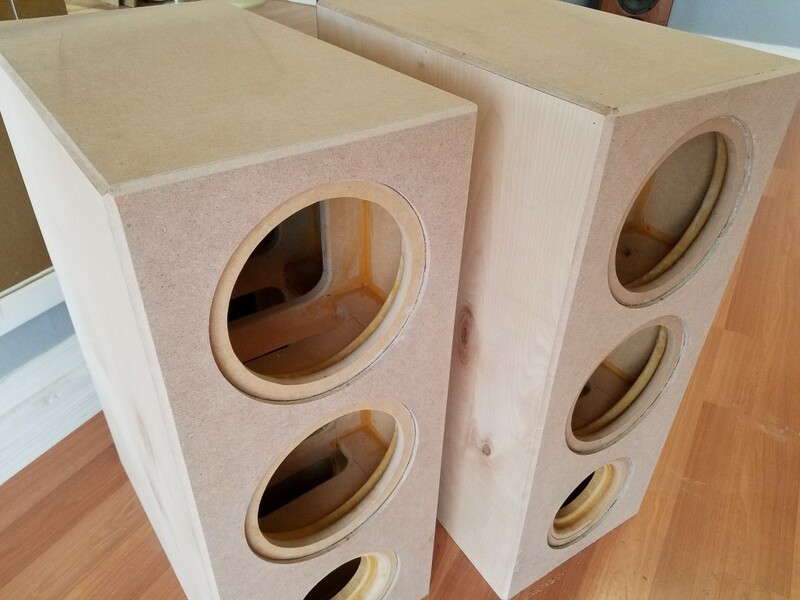 So I glued and screwed on the second side to each speaker. 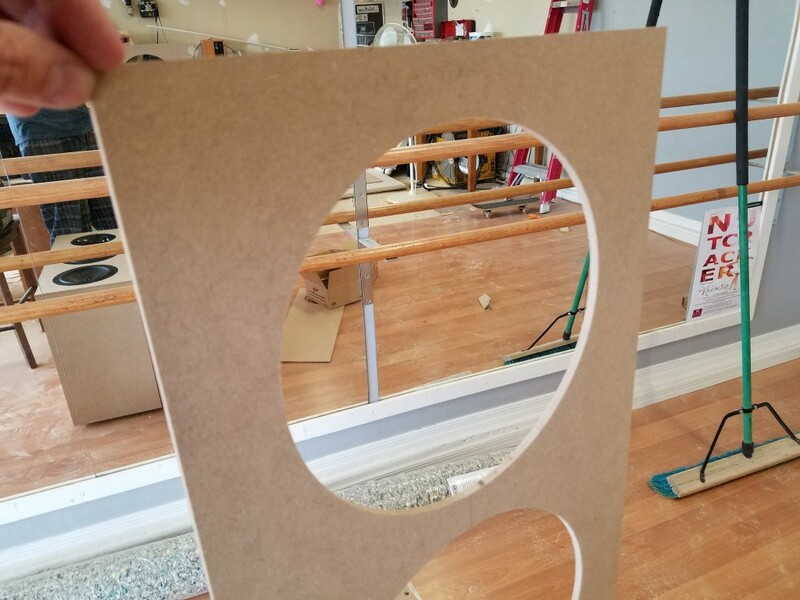 I then installed the back panel which is glued to the oval-patterned frame/brace which makes the back panel 1.5″ thick but not throughout the entire panel. There are oval cutouts in the first panel while the second is solid. 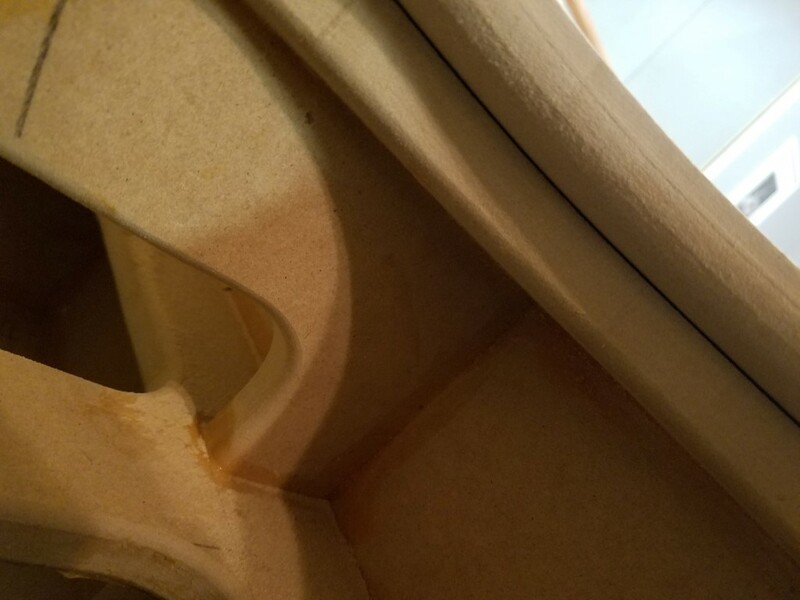 This stiffens the back panel without adding too much additional mass and buys me over 1 liter of extra internal volume. 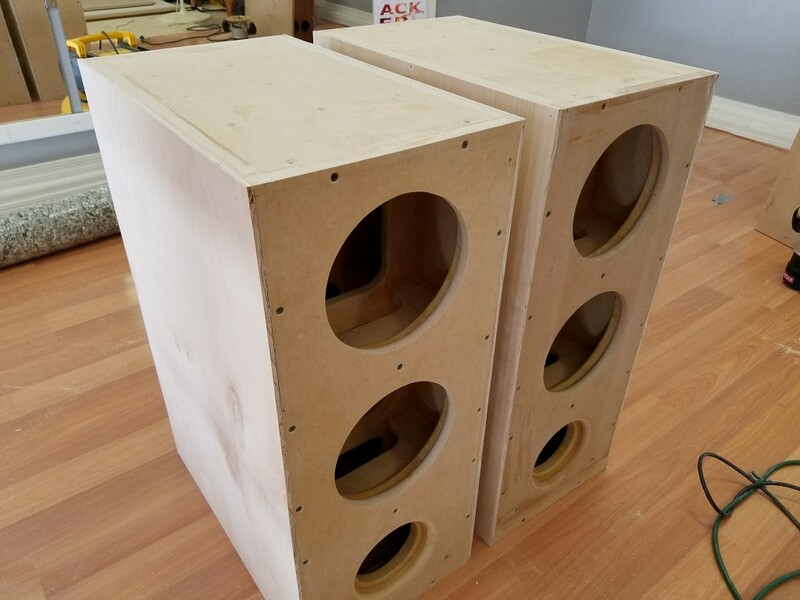 The front panel went on next and was measured with a makeshift compass (nail, envelope from Ace Hardware and a pencil) and cut with a jigsaw to mount each 8″ Dayton driver and the 7″ port. 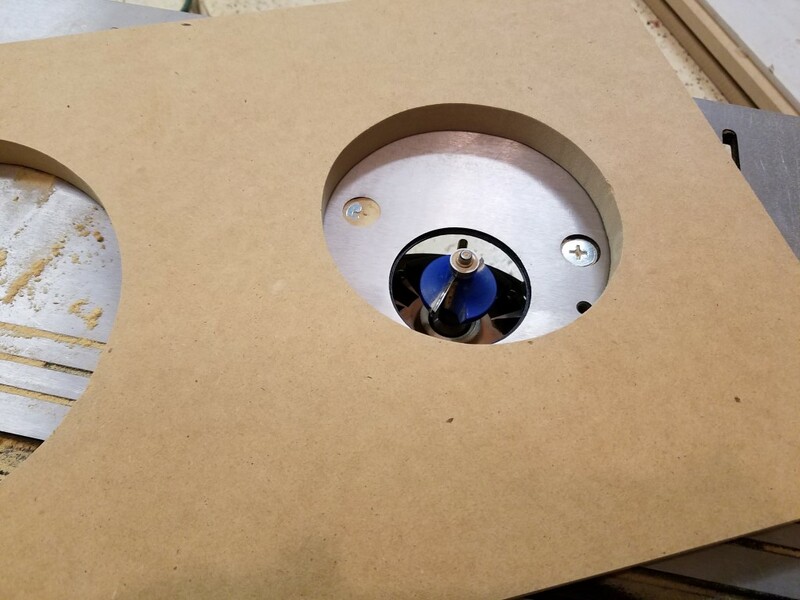 The driver opening is oversized by 1/16″ of an inch to allow some wiggle room for mounting each driver. 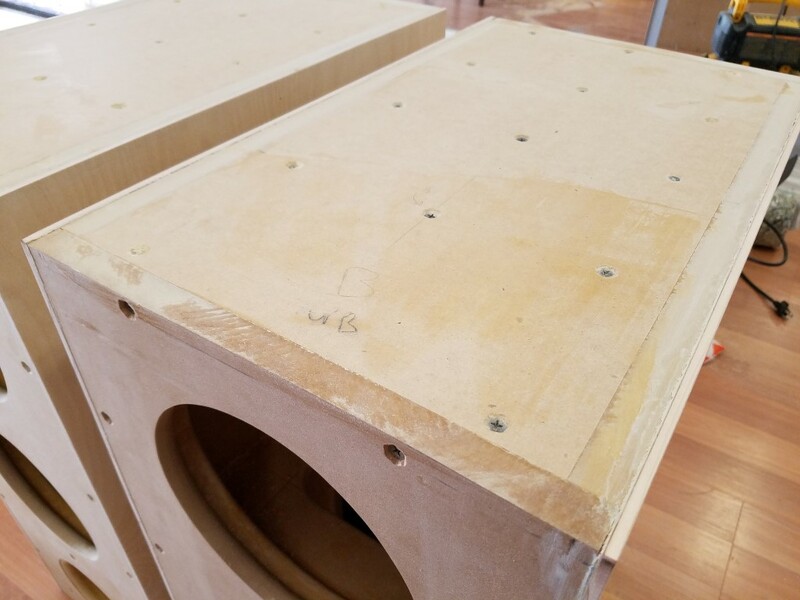 The backside of each opening was routered with a 1/2″ round-over bit to provide “breathing room” for the back/rear of the driver into the cabinet. Note that the internal panel, or the first main front panel, the opening was oversized by 1″ which leaves even more breathing room for the rear of the driver. 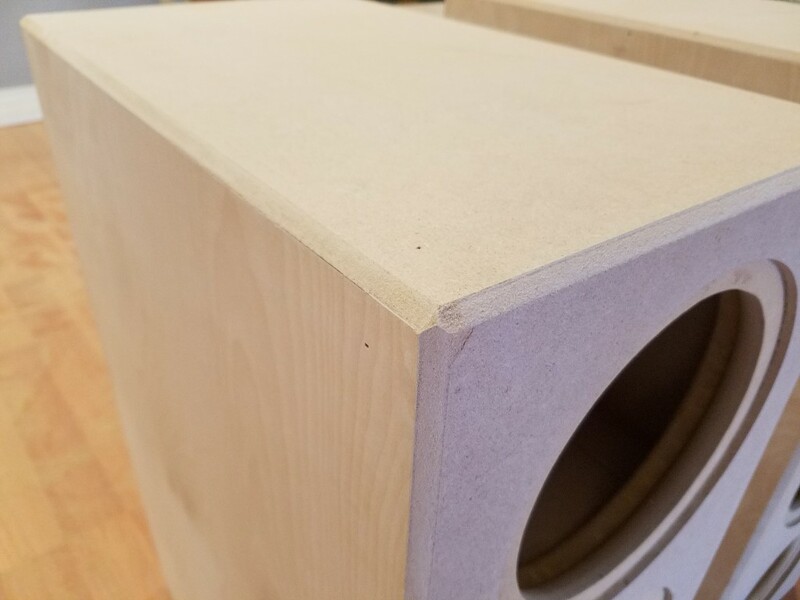 The front panel is now 1.5″ thick with a pair of 2″x3/4″ cross braces between the drivers and between the lower driver and port. 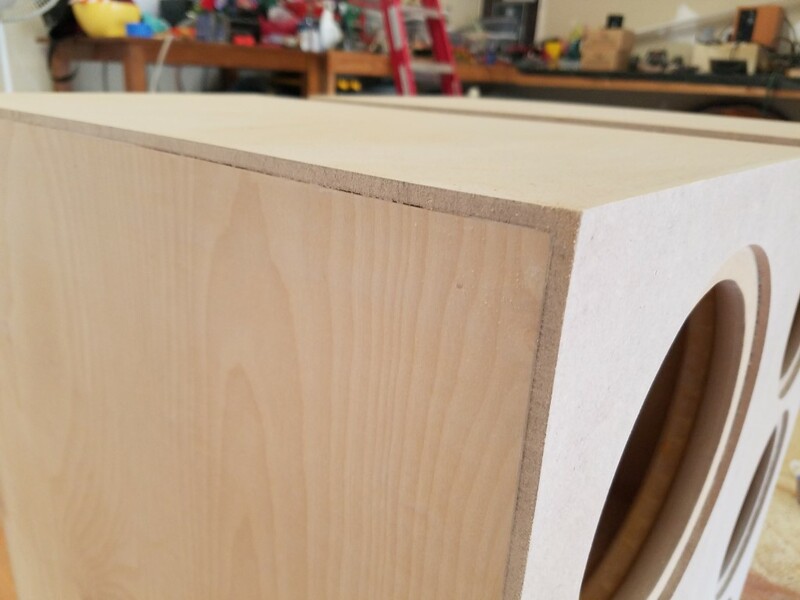 The cross braces also connect to the sides as well as the first window brace internal to the cabinet. 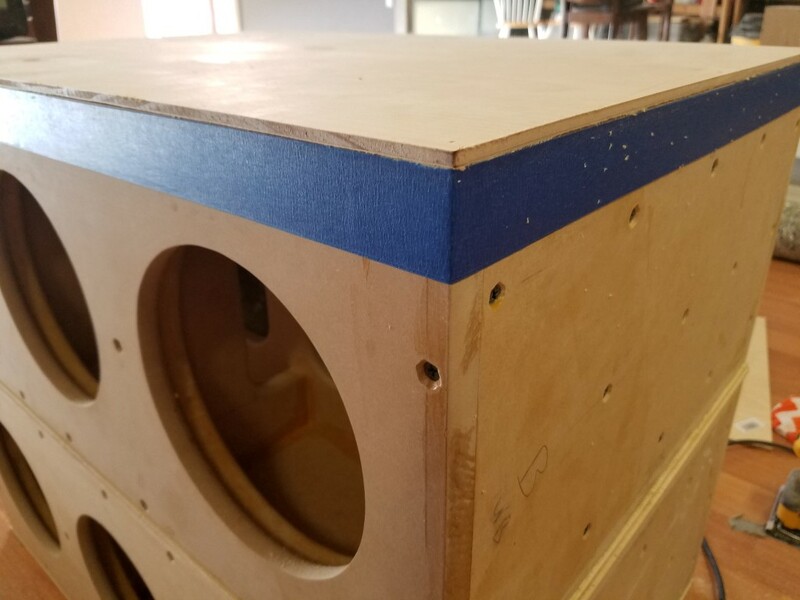 The idea here being the more braces that are structurally tied to one another, the better damped the braces will behave, and therefore the entire enclosure. Doing a simple knuckle tap test reveals just that, this sucker it well braced and solid! But it still sings like a canary since nothing is actually damped, yet. 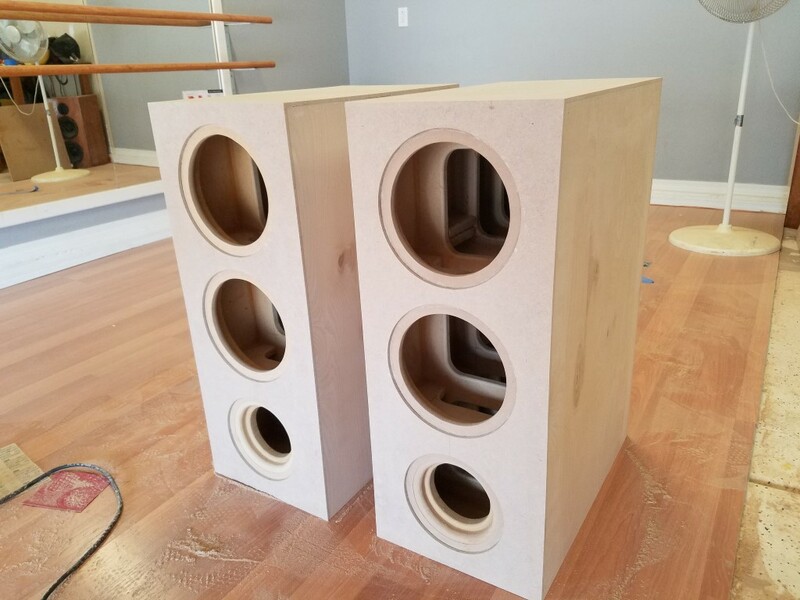 At this point I am basically done with the 3/4″ MDF (except for the 2nd bottom piece which will go on last) and the boxes look awesome but they also look terrible! 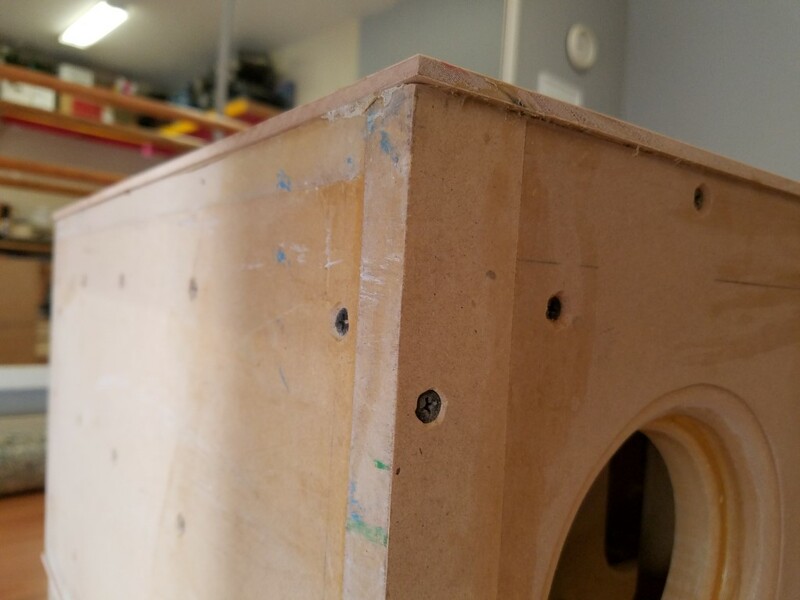 Screws and holes and glue are everywhere! There’s no way I’m going to try and putty and polish this thing up to paint it. It just wouldn’t be worth my time. 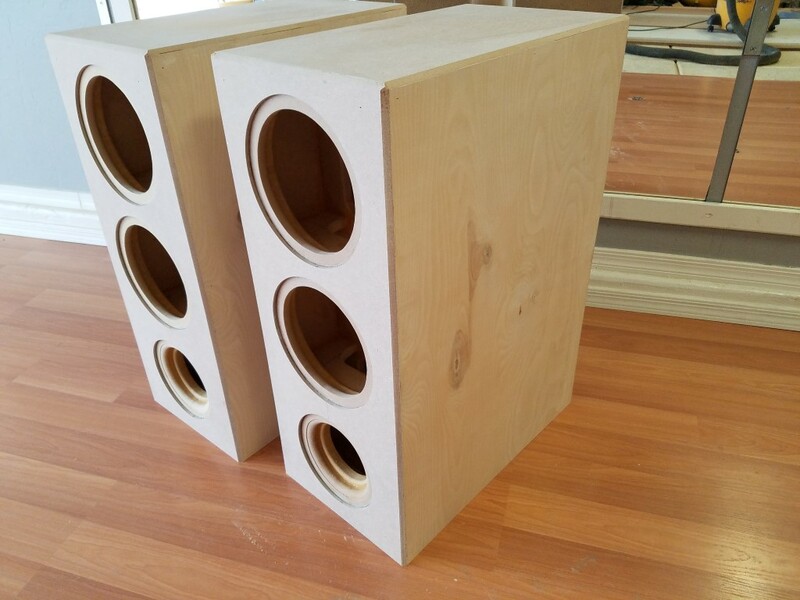 So instead I did my old trick of using sheets of 1/4″ MDF panels to “finish” the speaker cabinet. 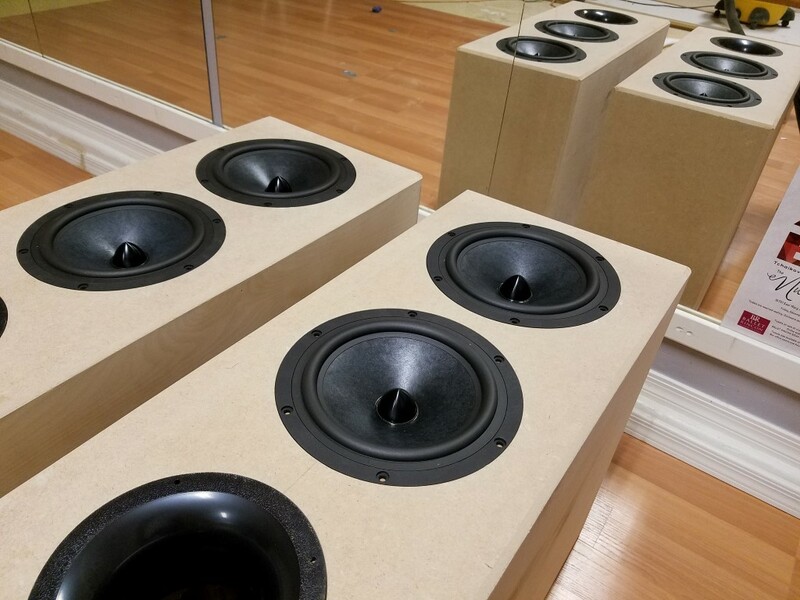 The 1/4″ front panel provides the exact depth required to flush mount each driver. 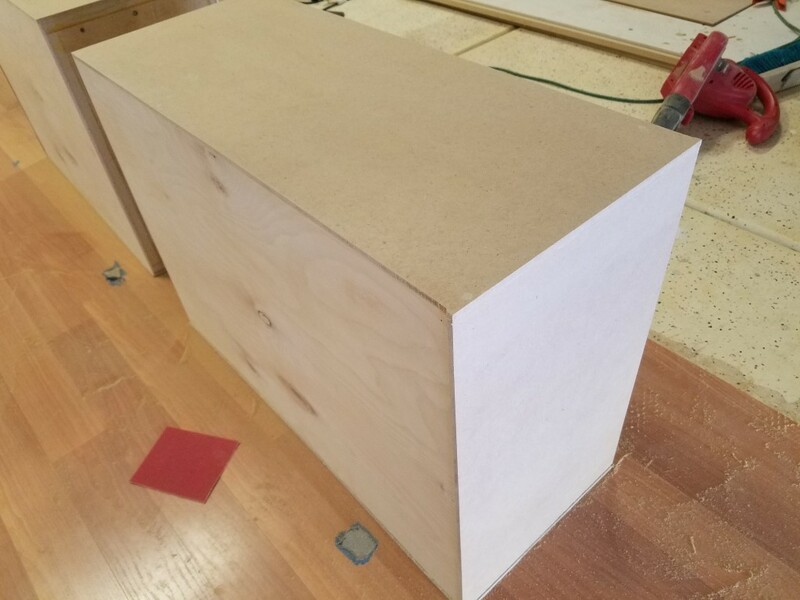 Then a piece on the top and back provide a super-nice and even finish which I will ultimately be able to sand and paint to a beautiful semi-shine. 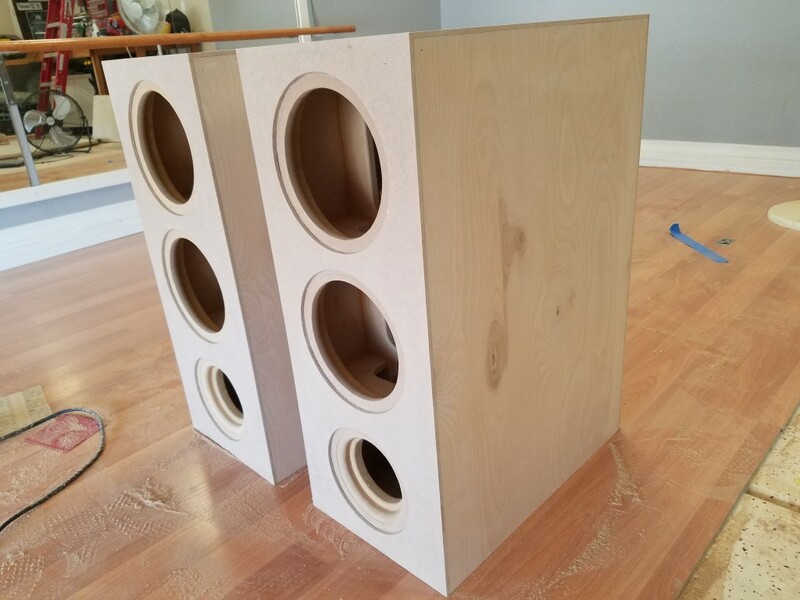 All those crummy MDF edges and screws get covered up in one shot. 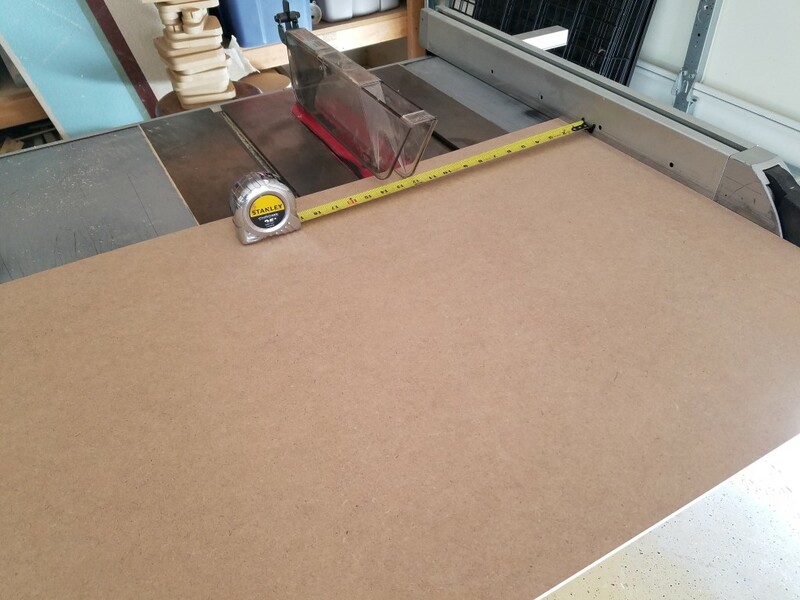 The 1/4″ MDF plus the 3/4″ MDF means the top is now 1″ thick and the front and back panels are 1.75″ thick. 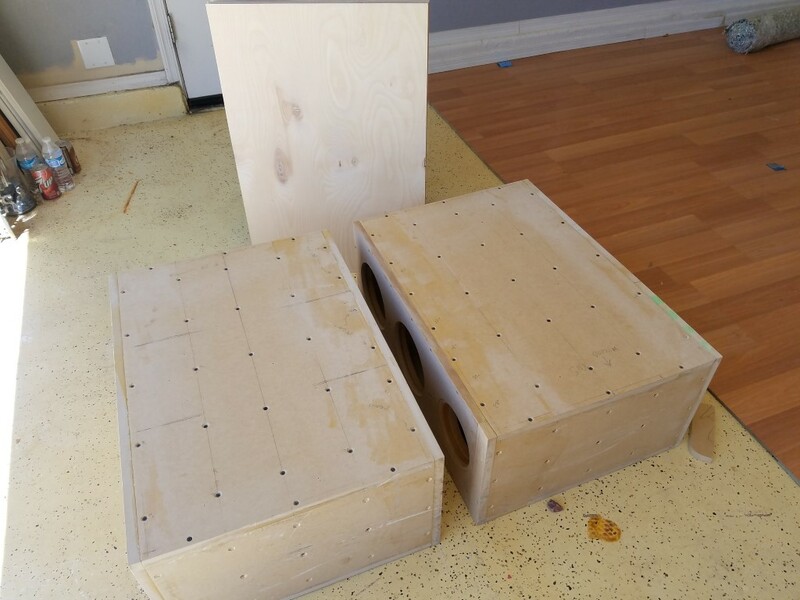 The enclosure is getting stiffer and beefier by the minute and not to mention, a lot heavier! 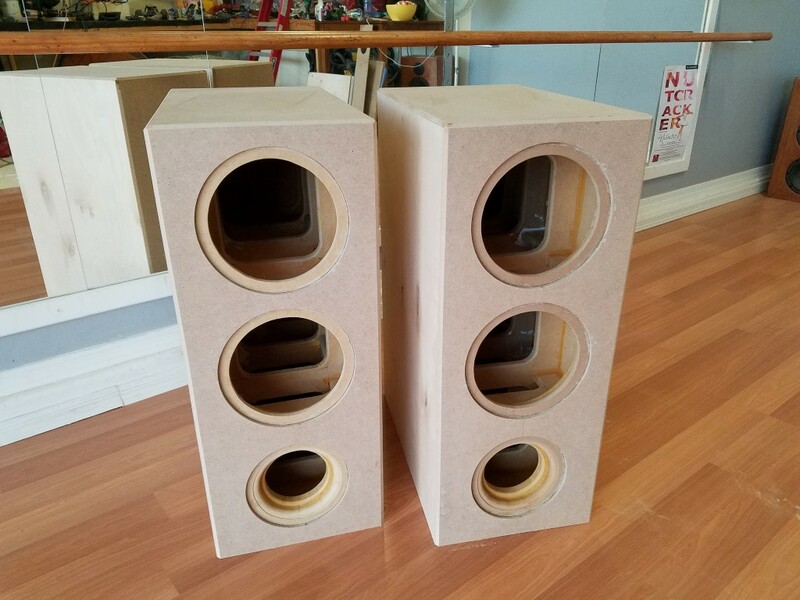 So while I was considering installing all these 1/4″ MDF panels, I decided I didn’t want a uniform finish on all six sides of this speaker. 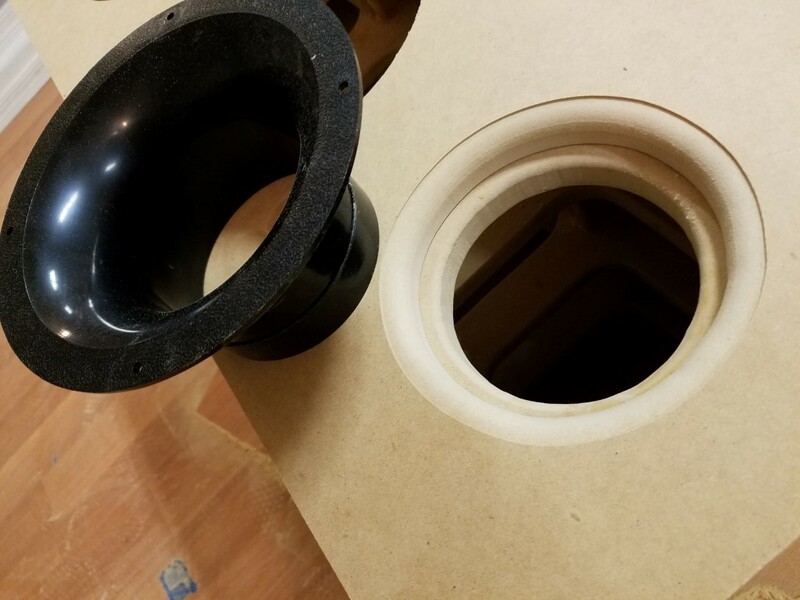 I didn’t want just an all-black speaker and I didn’t want to to have to try and paint the entire speaker and make it look perfect, because I knew I would not succeed. 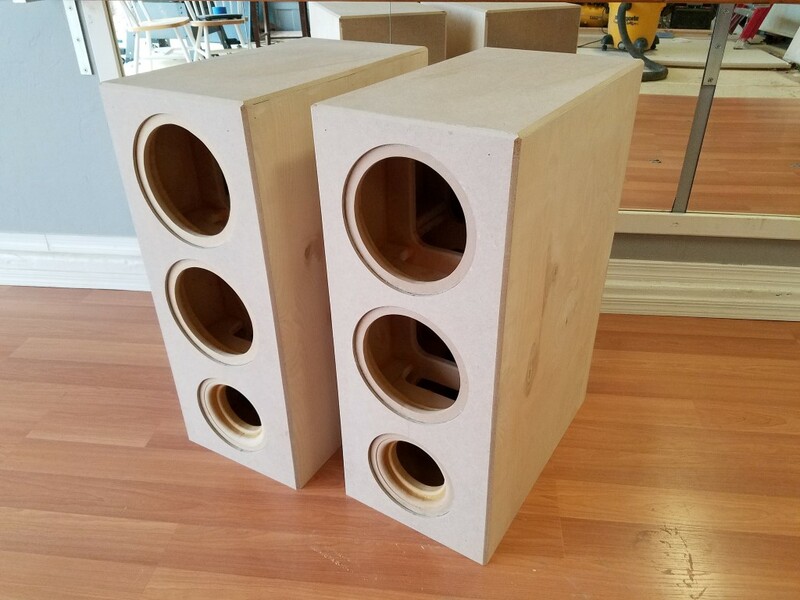 So the idea crossed my mind to use a real-wood veneer for just the sides of the speakers and then do the other 3 faces in the 1/4″ MDF. 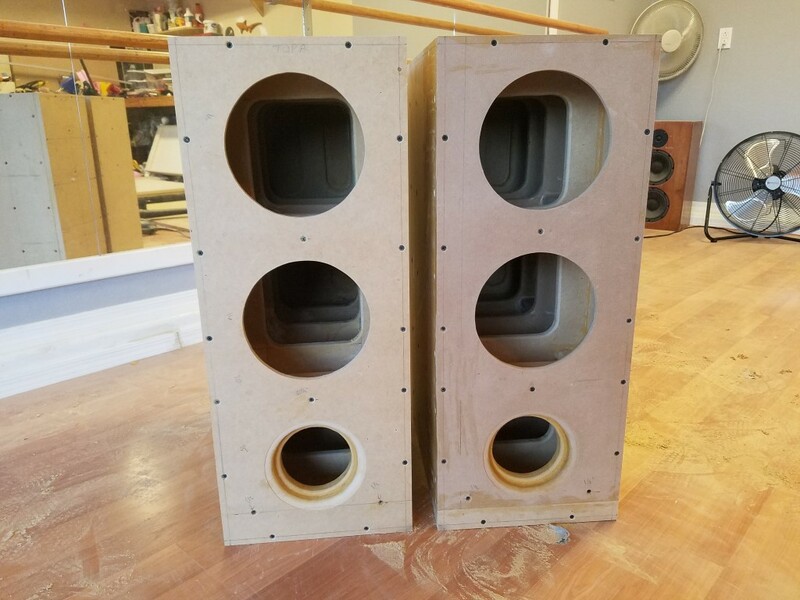 This is a design scheme that I’ve grown rather fond over the years and a technique I’ve done on several speakers I’ve built in the past. 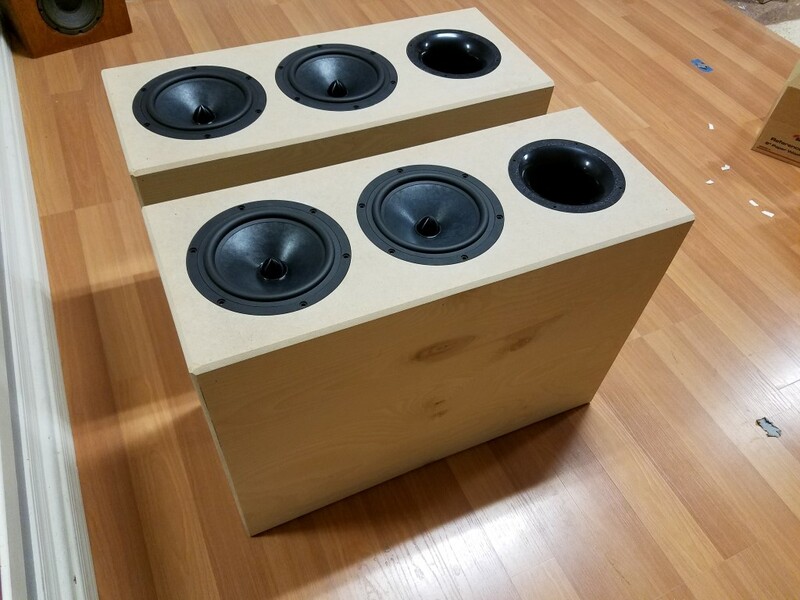 The real wood stained combined with a nice semi-gloss black should look awesome together. 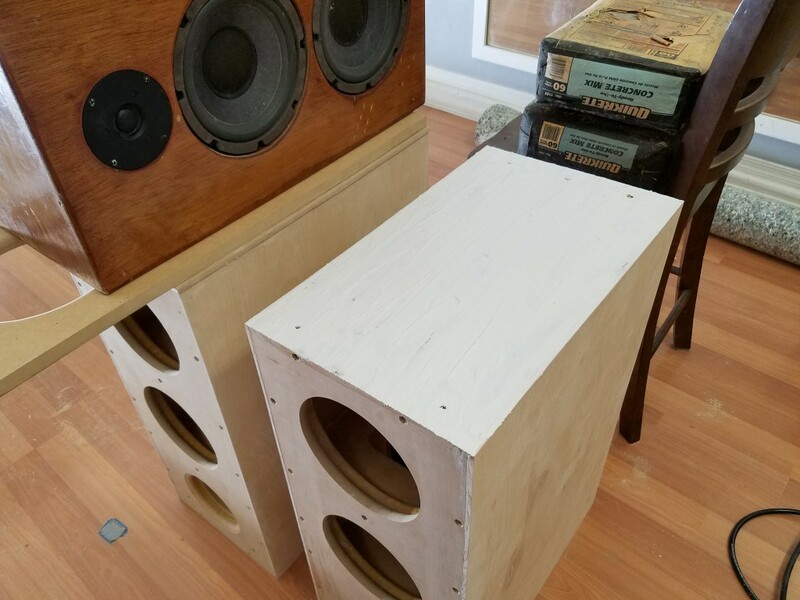 Plus I can stain wood only slightly better than I can paint it, or at least staining seems to be more forgiving for me. 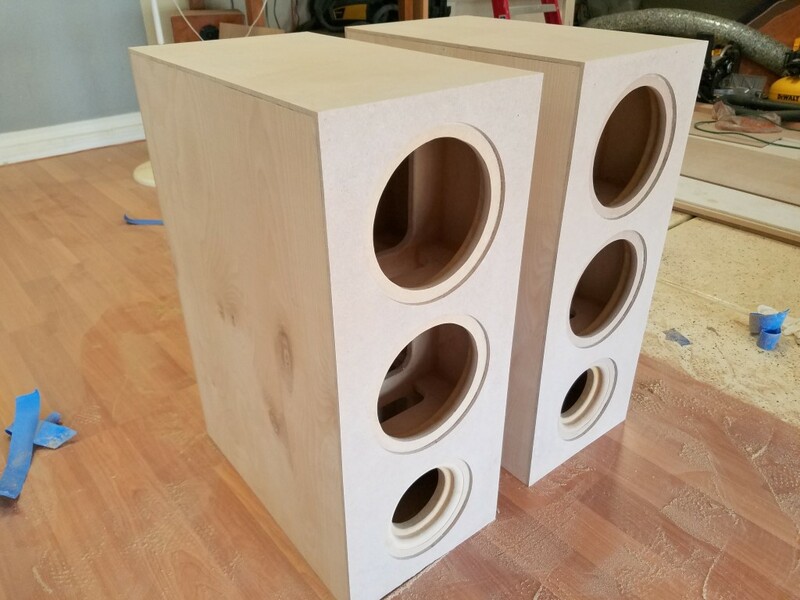 So if I can get the stained sides to look great, then all I really need to get perfect is the front and the top. I think I can handle that. 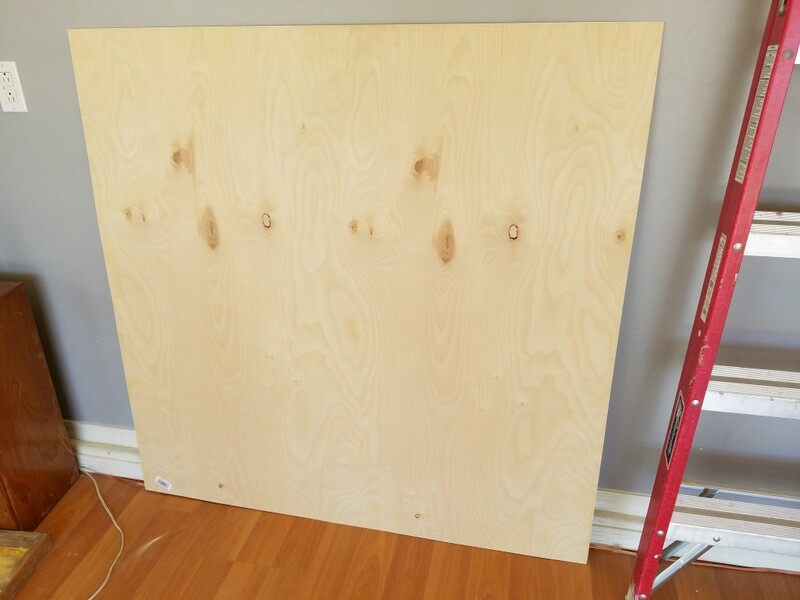 I picked up two 4’x4’sheets of 0.20″ (1/4″) Birch plywood from Lowe’s. 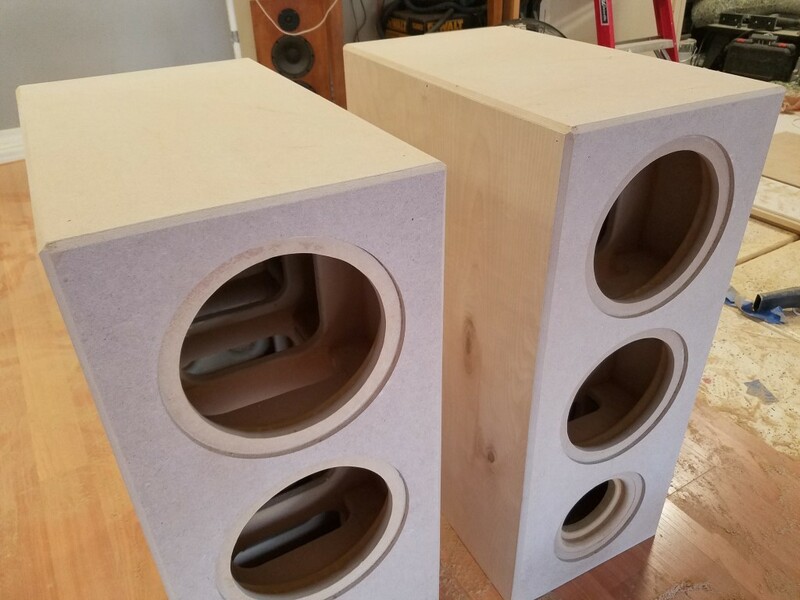 I rummaged through the only 8 pieces they had and picked two that had some nice, unique natural wood grain patterns that I thought would look cool when finished. 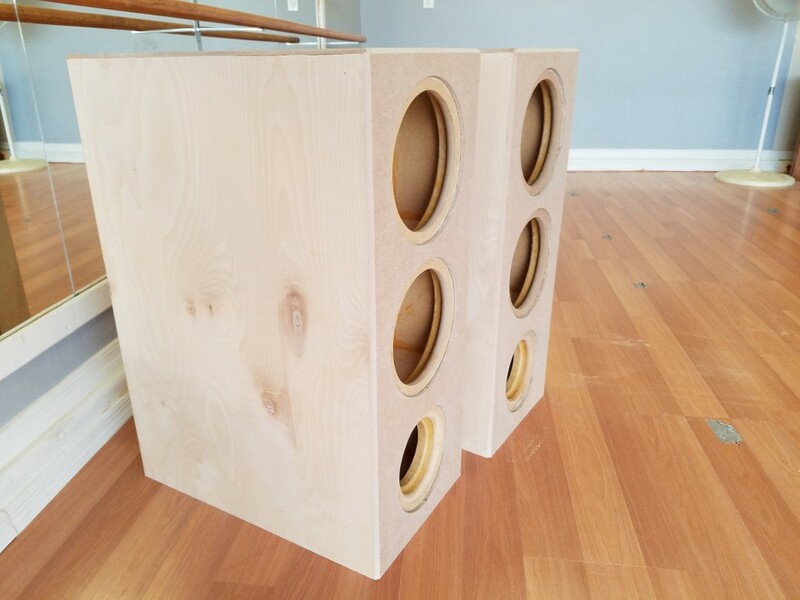 I cut each piece to fit the sides of each enclosure and oversized each piece by 1/8″. 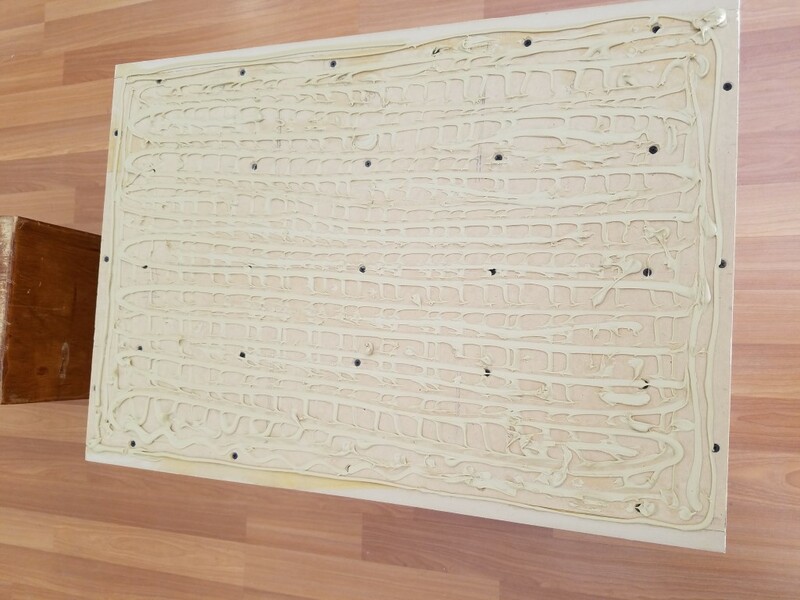 Each piece was glued to the cabinet wall using Liquid Nails. 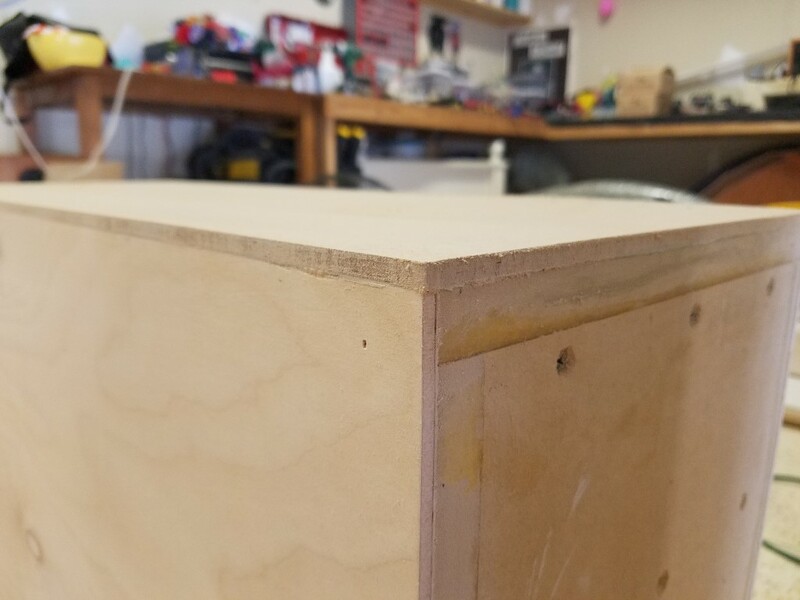 I applied pressure via my own body weight to press the Birch into the glue as much as possible. 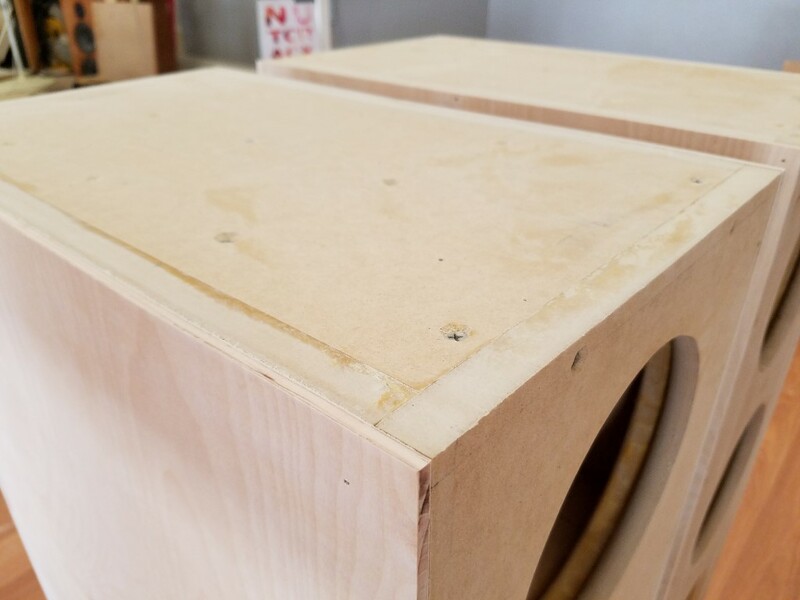 Once it was well seated, I popped in a some 1″ (18) gauge brads into each corner to prevent the panel from drifting, flipped it over and did the other side. 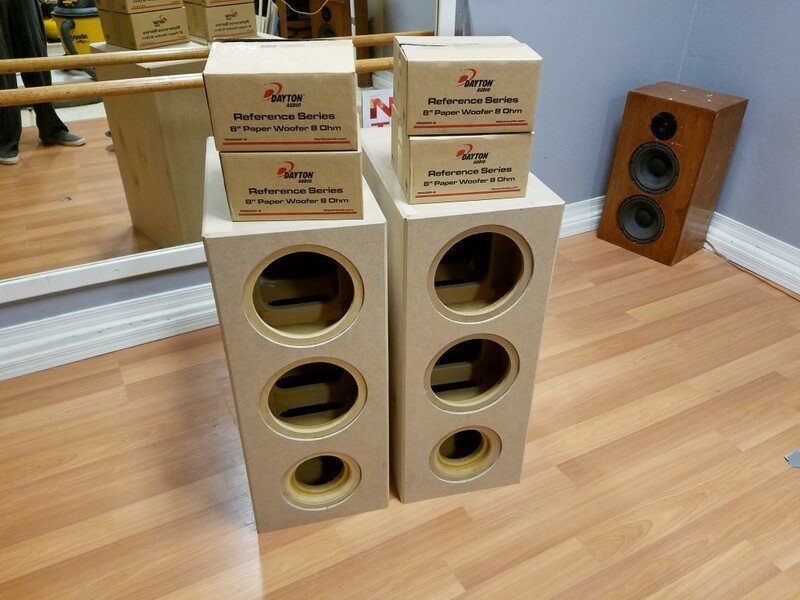 Then I did the other speaker and stacked them on top of each other. 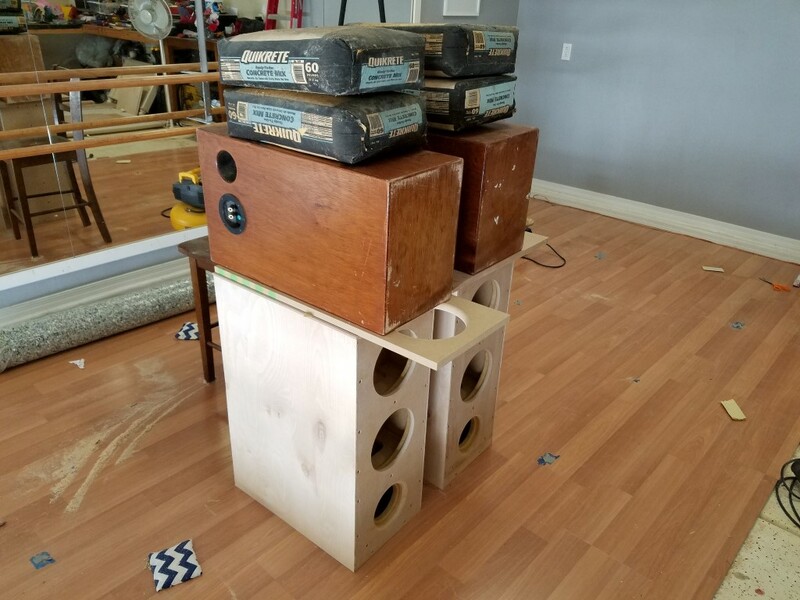 I added two really old speakers I use in the garage for music along with 240 pounds worth of QuickSet concrete bags (one of which got wet from the rain and is literally a solid block of concrete). 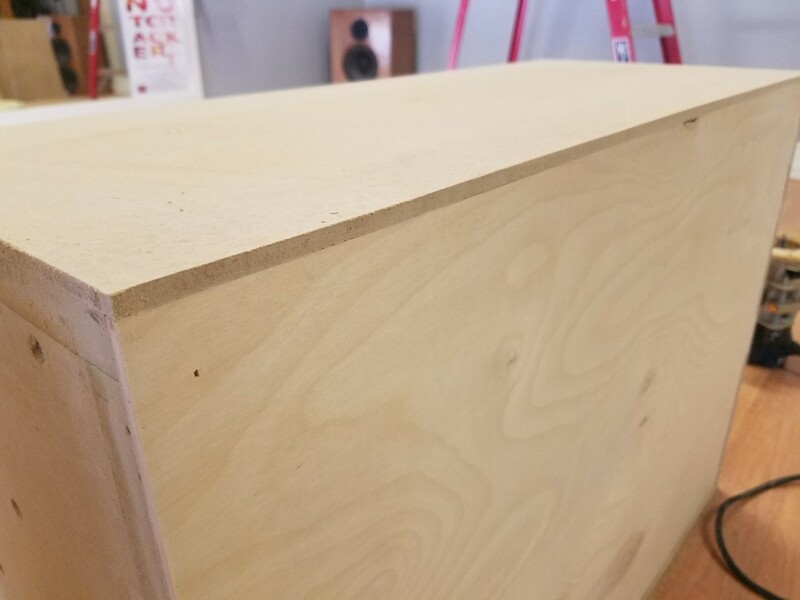 This was just enough to keep some even pressure on the entire surface of the newly glued pieces of Birch plywood. I let that dry for 24 hours before tearing my mass tower down. 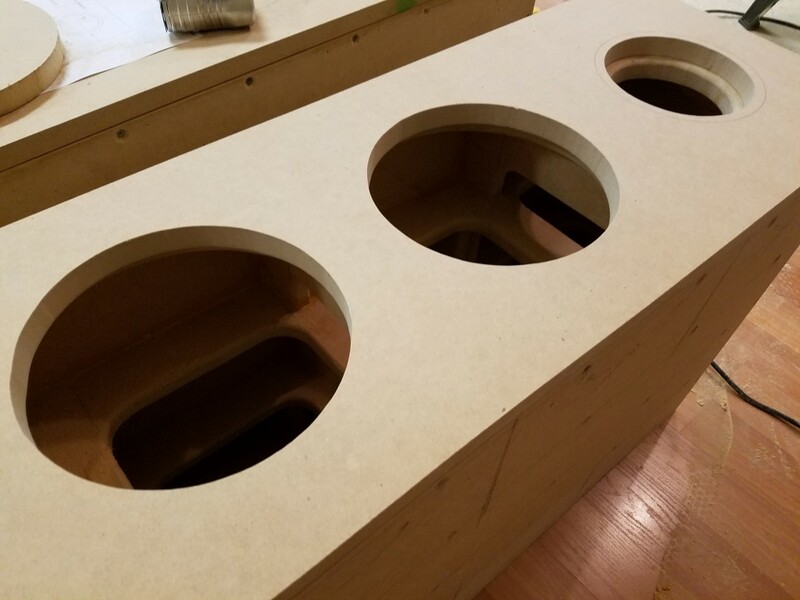 This is the point where I added the 1/4″ MDF to the front, top and back. 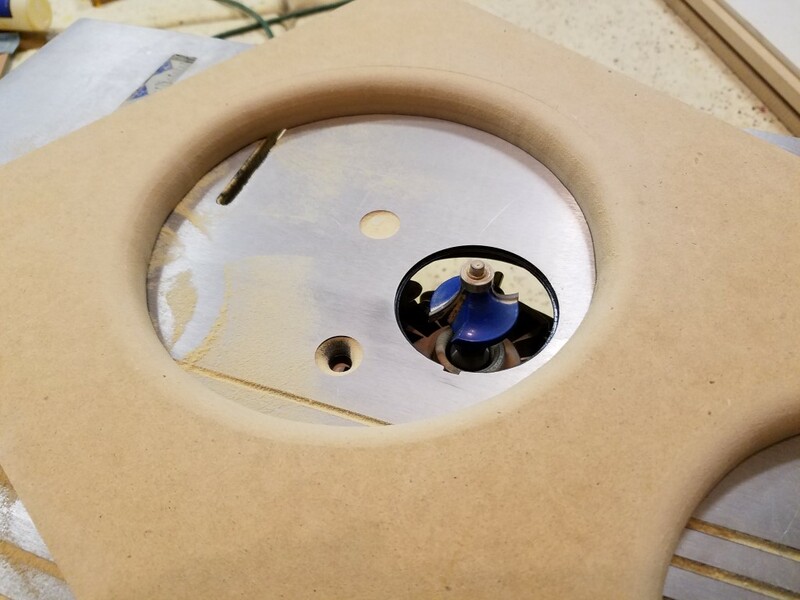 The front baffle was cut using a Jasper Circle Jig from Parts Express. This tool is awesome! 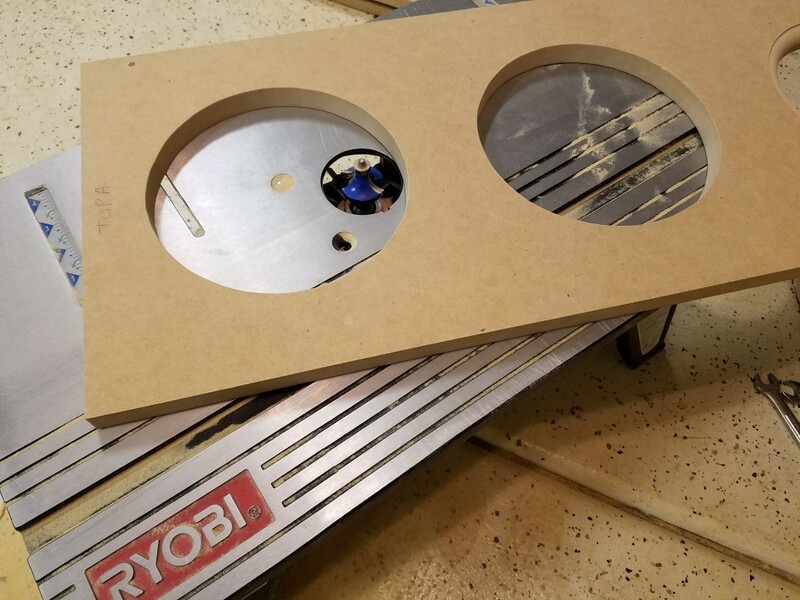 Since this is a visible cut, I didn’t want to use my jigsaw, I needed that cut to be a perfect circle. 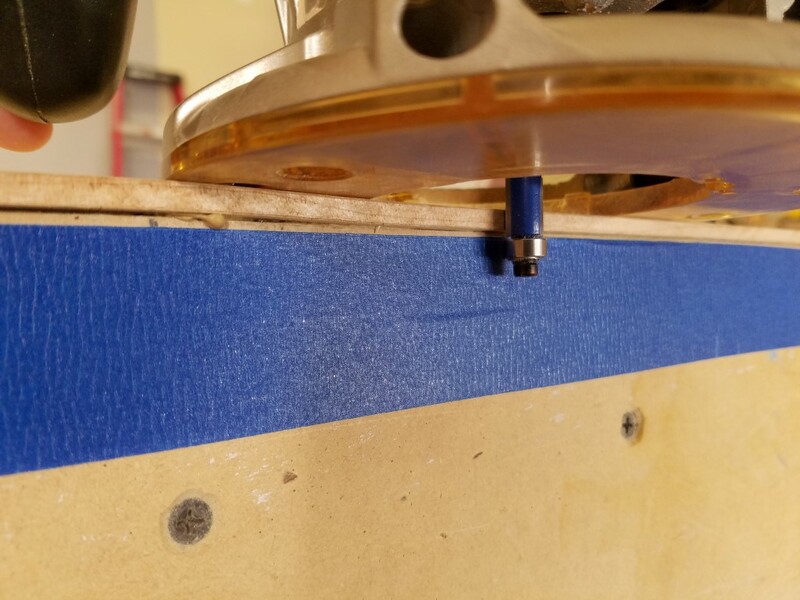 With 1/16″ increments, I made some practice cuts to pre-fit how much gap I wanted between the edge of the frame of the drivers and the edge of the baffle. One size was too big, so I dropped it down, then it was too small, so I picked a spot right in the middle. Perfect fit! 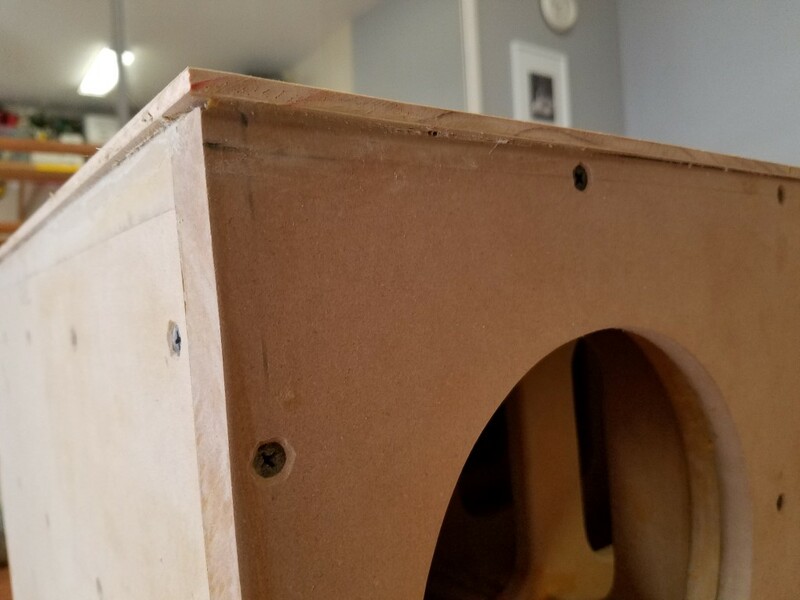 The overall size ended up being 0.031″ larger than than driver (or ~1/32″) which leaves about a 0.015 inch gap all the way around the driver. This gives me some wiggle room to fit the driver as well as some room to grow from paint/polyurethane. 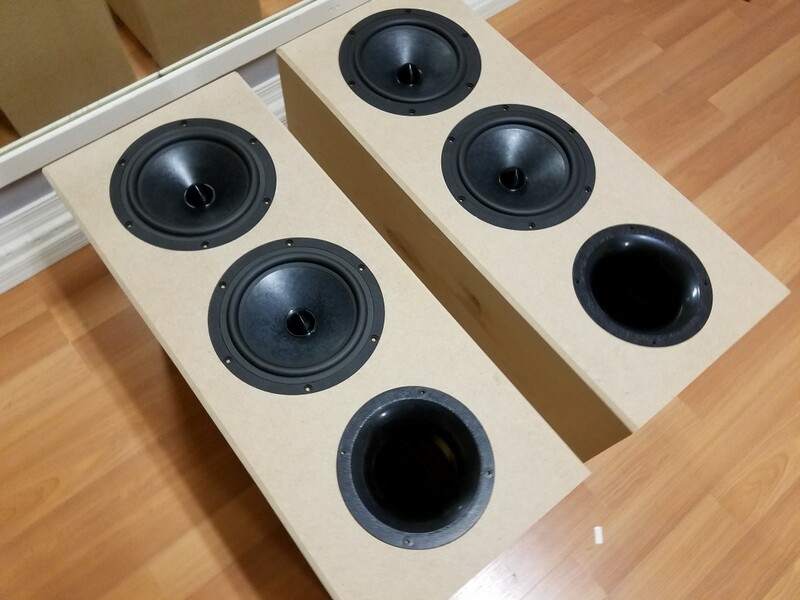 You can see from the pics though, the fit is perfect, if anything I went too small and drivers won’t fit after I paint them! I am going to have to be careful and watch that inner diameter. I may even need to mask it off after a certain number of coats to keep it from being undersized when I’m done. 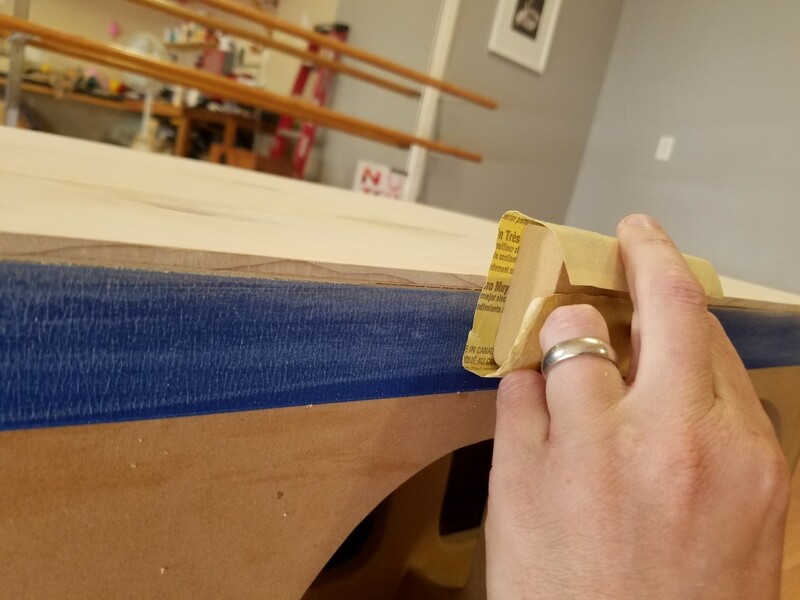 Anyway, I used liquid nails again on all the 1/4″ pieces mainly because the viscosity of Liquid Nails is so much thicker than wood glue that I have a much better chance of controlling the squeeze out. 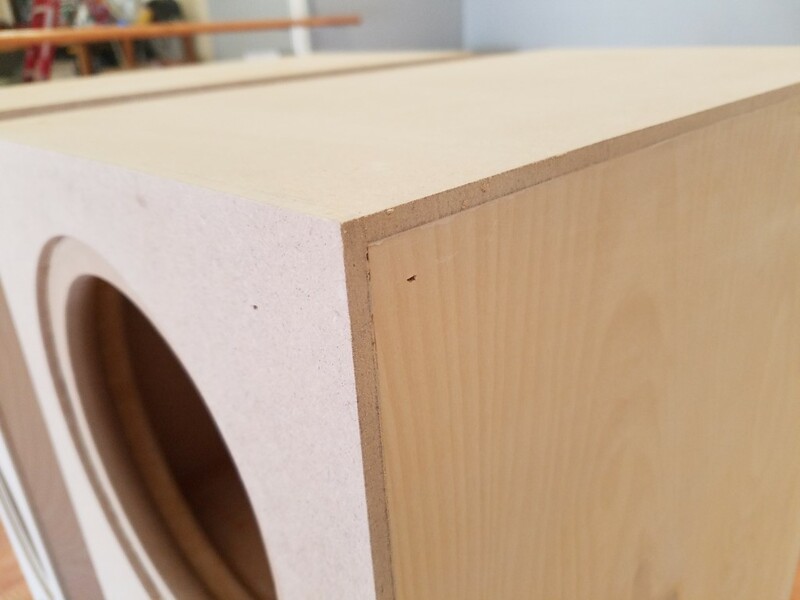 The reason this is so important at this stage is because both of the enclosure sides have that beautiful Birch ply finish which does not take kindly to a smattering of runny wood glue. 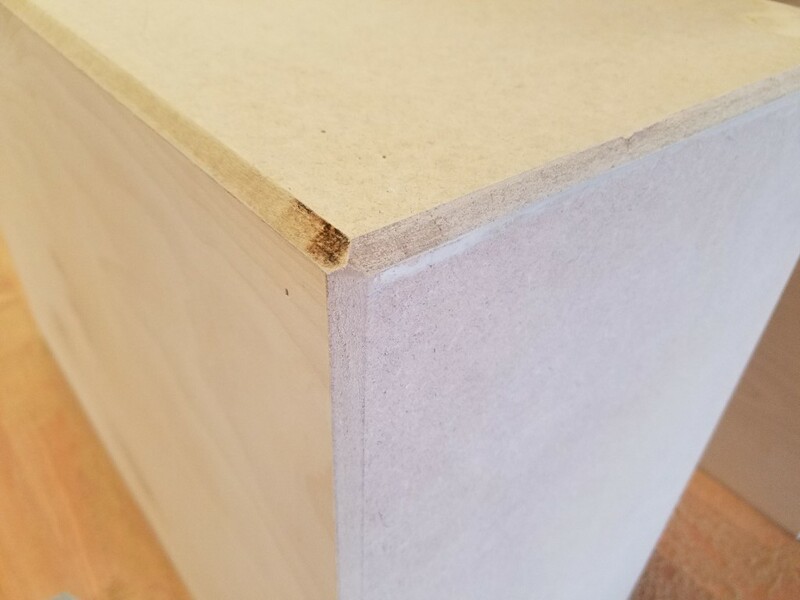 Since it’s only Birch ply, the actual Birch is extremely thin and doesn’t give me much option to sand down/away any place that the wood glue would have touched. 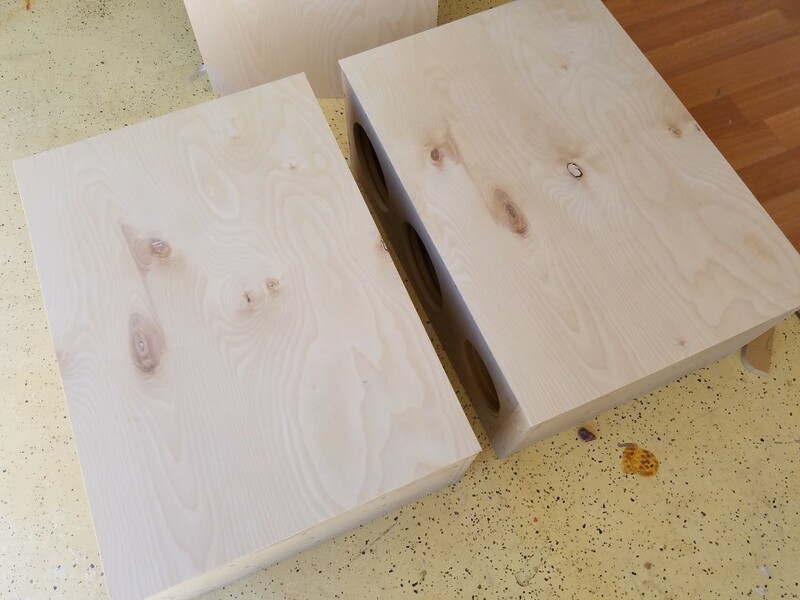 With the Liquid Nails I can ensure that the Birch is untouched while the other panels are being glued in place. 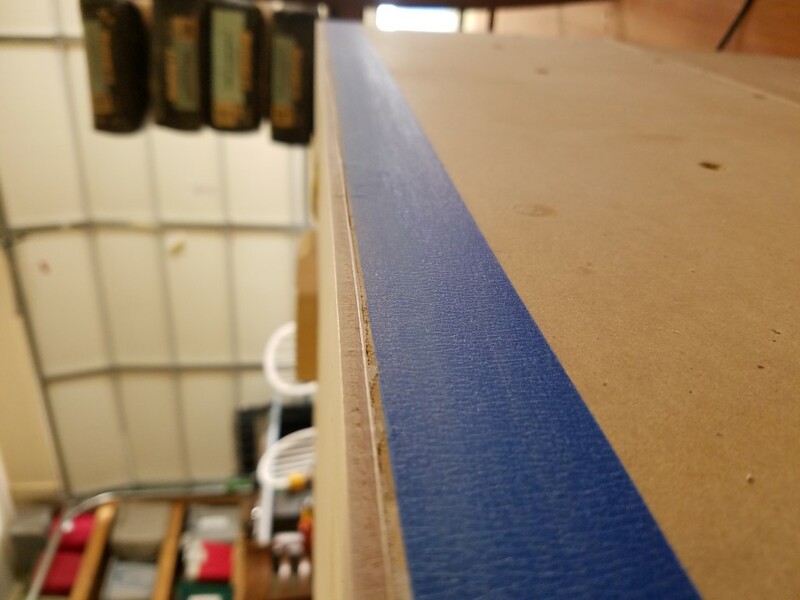 Even then I still covered the Birch with 2″ blue painters tape, just in case. 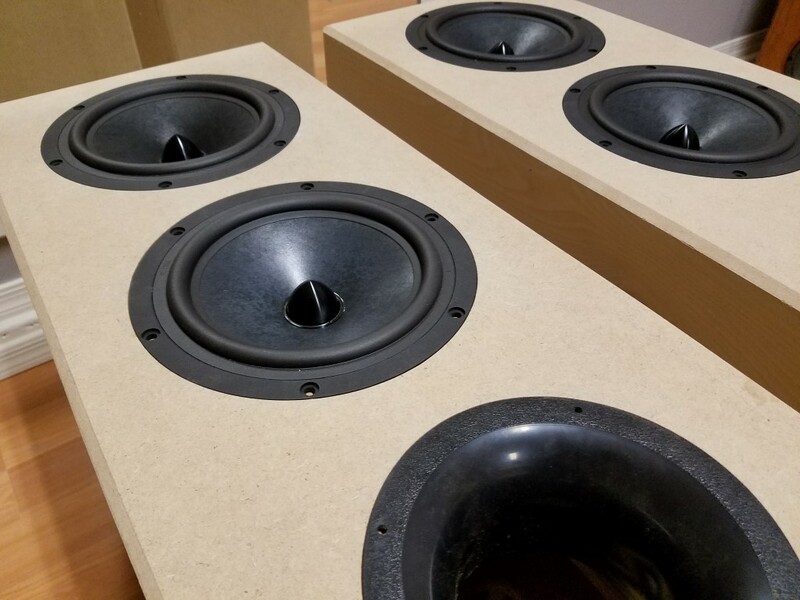 The old speakers and 240 pounds of concrete sat on top of the speakers for another 24 hours while all the 1/4″ panels dried in place. 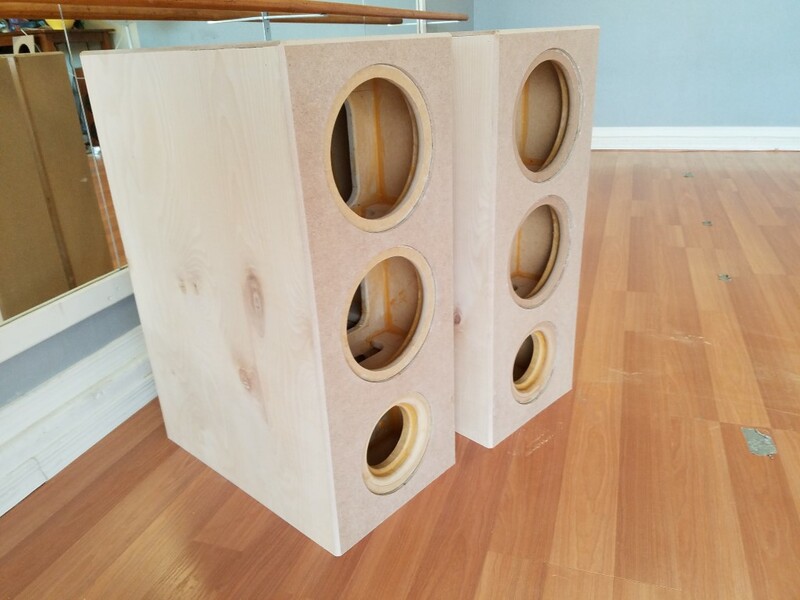 Again, the 1″ brads held the panels in place to keep them from walking while it was drying. 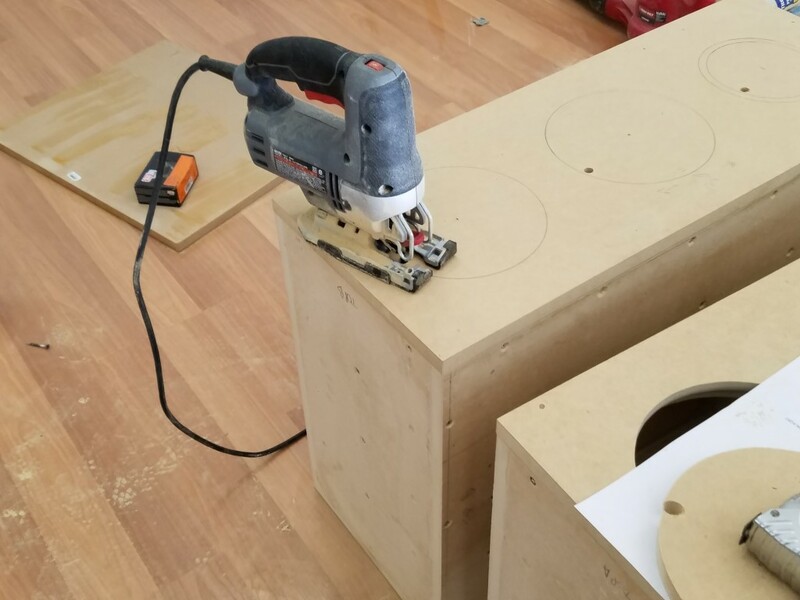 So now that all the panels are installed and dry (and they aren’t coming off, ever), since I had oversized all the pieces, I needed to use my router to trim each piece flush to each side. 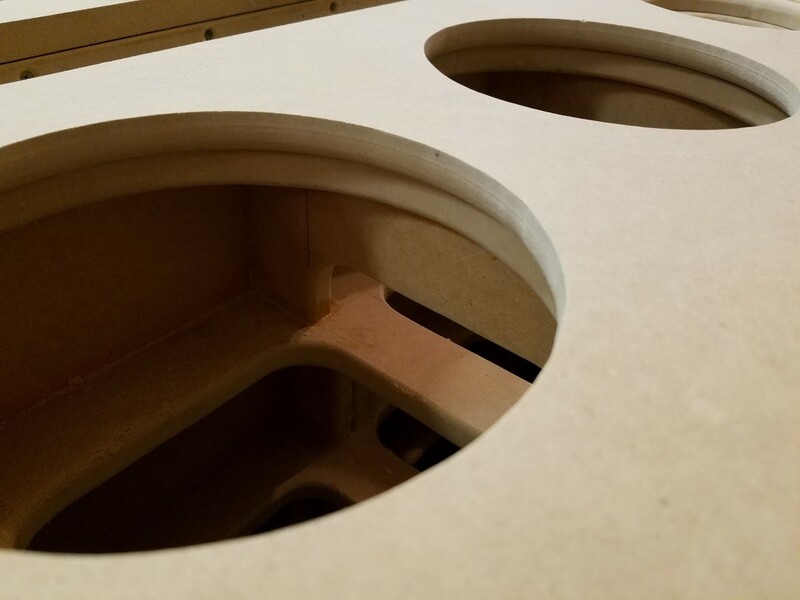 This was accomplished using a 1/4″ flush bit and a router. 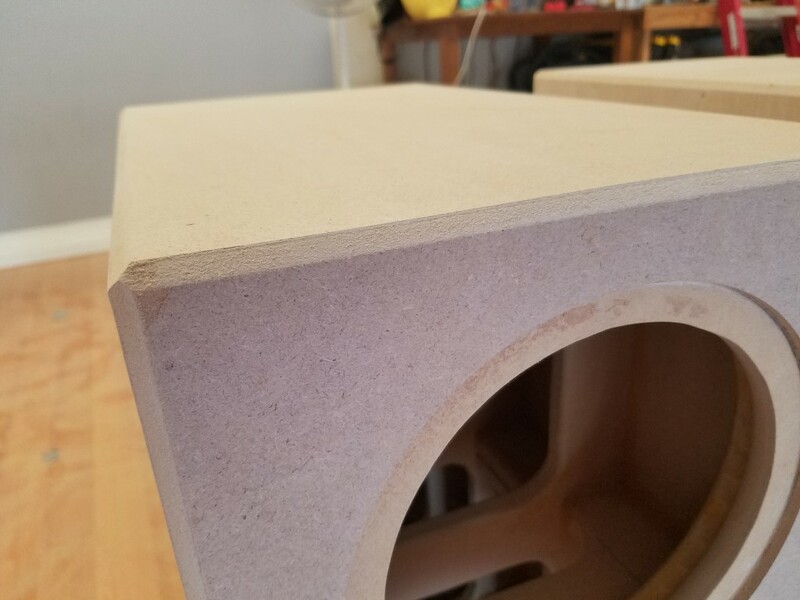 I took the router to each side and zipped along its edge at just the right depth so as to only trim the MDF without touching the Birch. 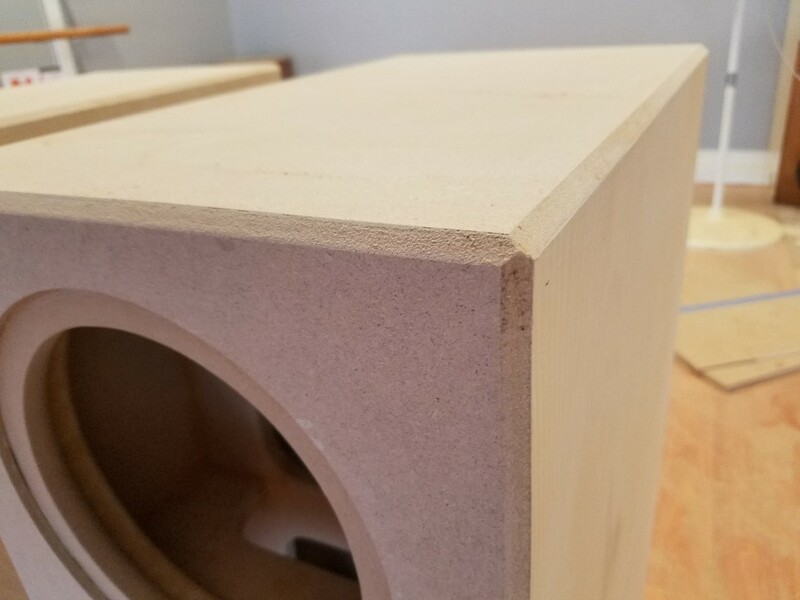 Once complete, this left a perfectly flush edge on each side of the speaker from the MDF to the birch and the MDF to the MDF (front-to-top-to-back). 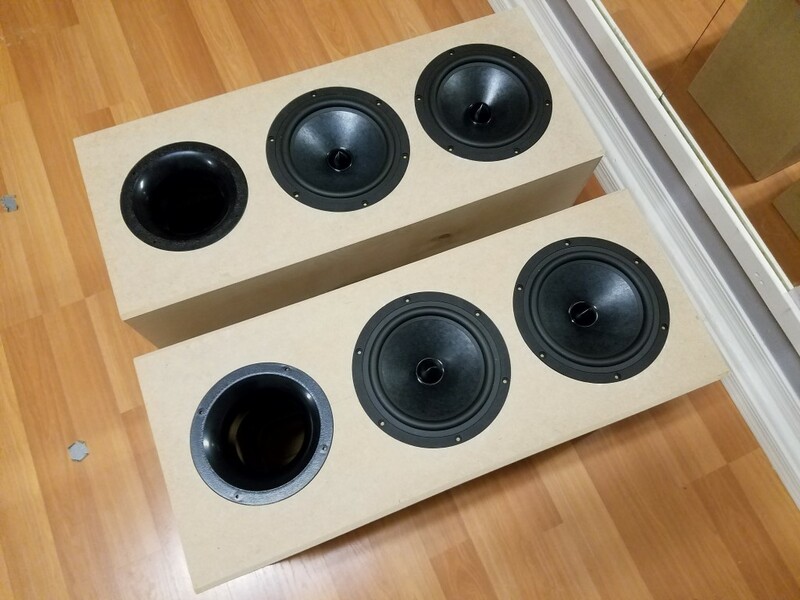 Oh yeah, I had done this already to the Birch plywood before installing the 1/4″ MDF since it was also oversized when installed. 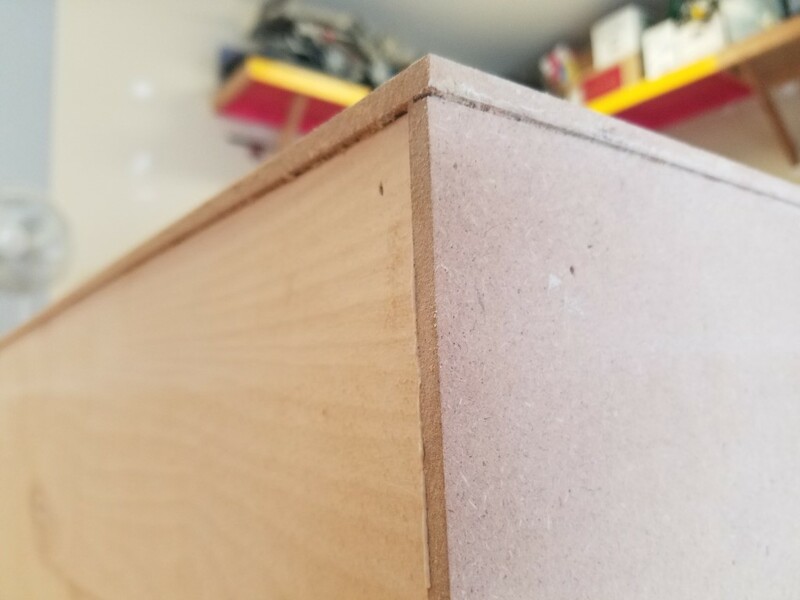 That was made near-flush to the 3/4″ MDF leaving some room to account for the thickness of the Liquid Nails (about 0.015″). 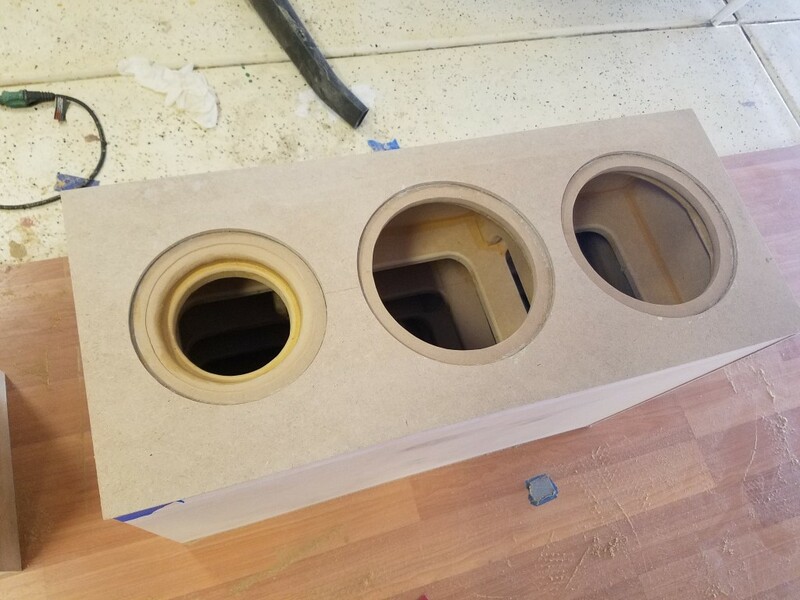 I am almost done at this point but there’s one more finishing cosmetic touch to add, and that’s the 1/4″ 45° chamfer on all the 1/4″ edges. 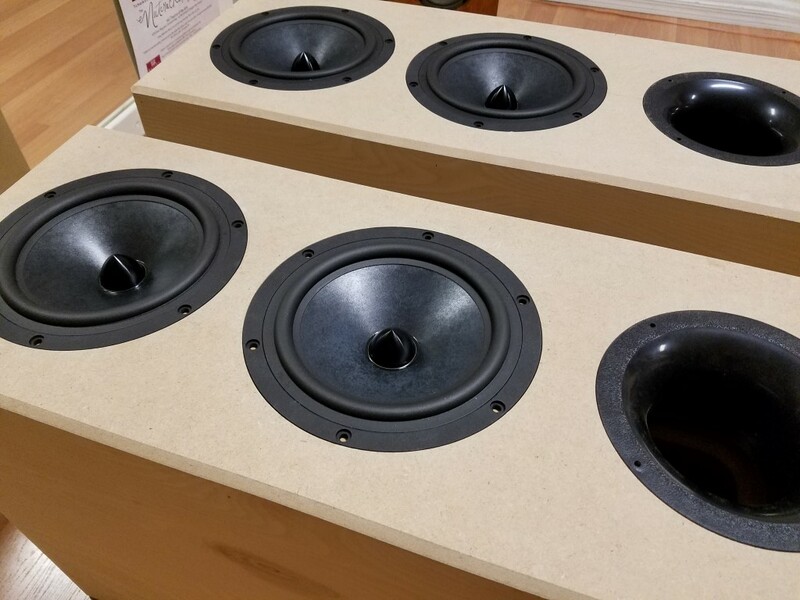 This look, I have to admit, I borrowed from the VR-5’s but it really does give the speakers just a little bit of extra class, something notable, something different, that overall fits the look and style of this speaker perfectly. 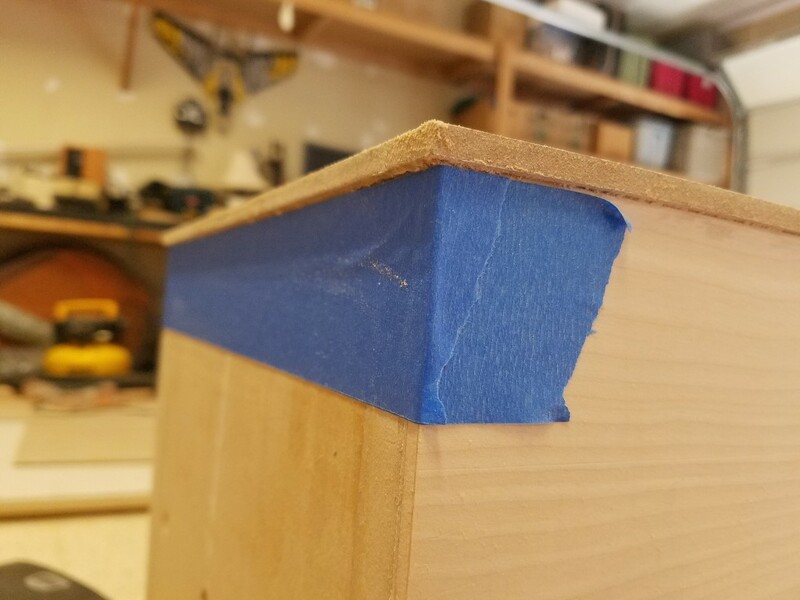 I will still have to seal this edge, since it’s just MDF, but having that angle to it on each side meet at a point at each of the four corners just looks…so cool. 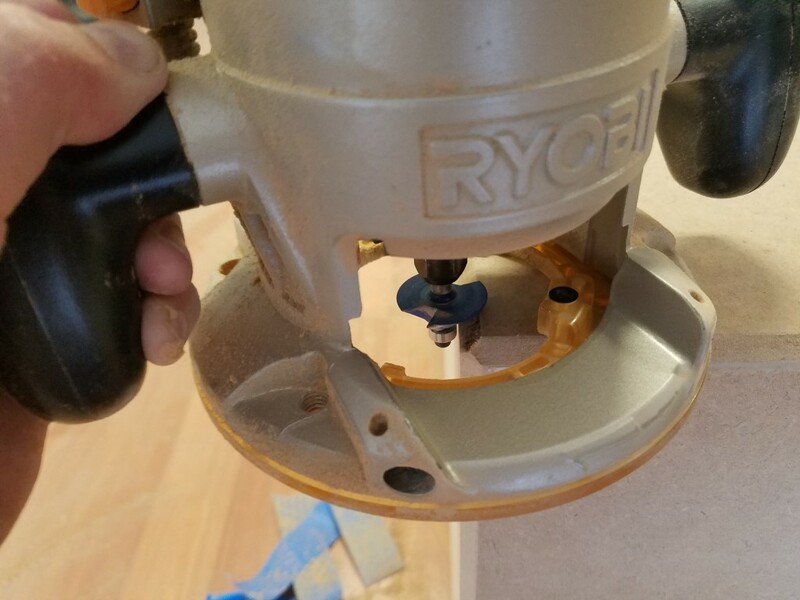 Totally subjective sure, but for the cost of a 45° chamfer router bit and the 20 minutes it took to router it, in my mind, it was well worth it. From a baffle edge diffraction perspective, a roundover would have had less diffraction than the 45° chamfer but it’s still better than a 90° edge. 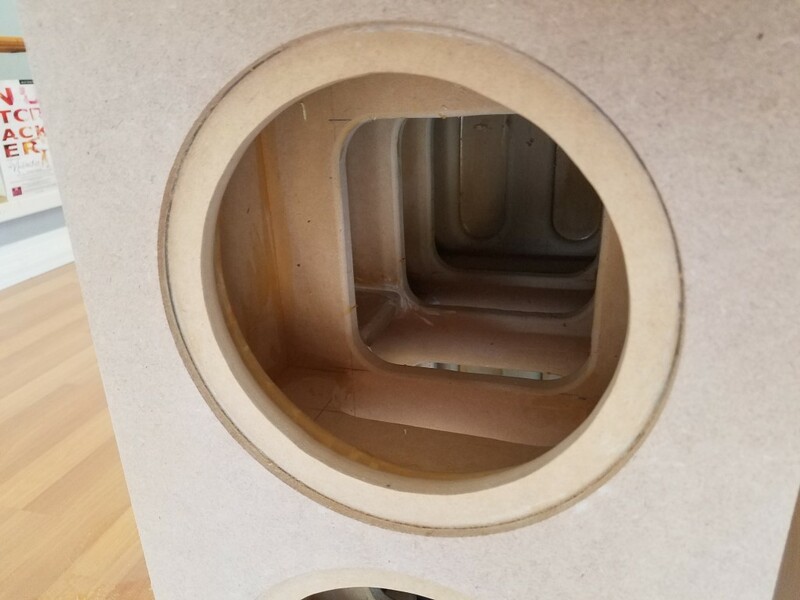 And in practice to get any significant benefit or reduction in edge diffraction, the roundover needs to be quite large, which in my opinion, ruins/changes the aesthetic of the speaker. 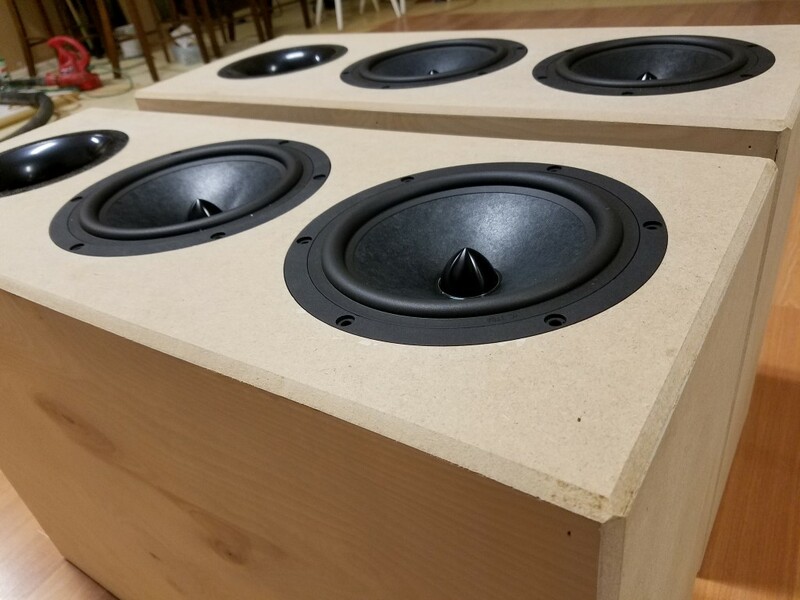 Arguably the upper frequency limit of these cabinets will neither benefit nor suffer from edge diffraction effects but I intend on carrying this design into the upper enclosures which will run all the way to 20 kHz. So it’s at least important to keep it in mind. 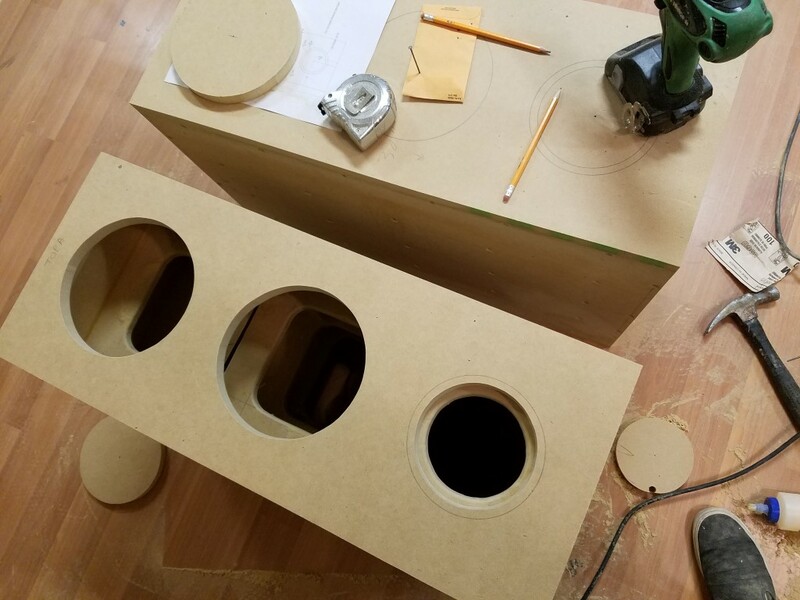 The overall shape of the upper cabinet should help with diffraction effects also, but I’m getting off topic, and ahead of myself. So with that, that’s about it, I’ve reached by 1000+ word limit so it’s time to just put up the rest of the pics and let them tell the rest of the story. Enjoy!